Bridges To Prosperity 2018 - Traylor Bros., Inc.
Well, it’s finally here, inauguration day for the bridge and all of it’s glory. 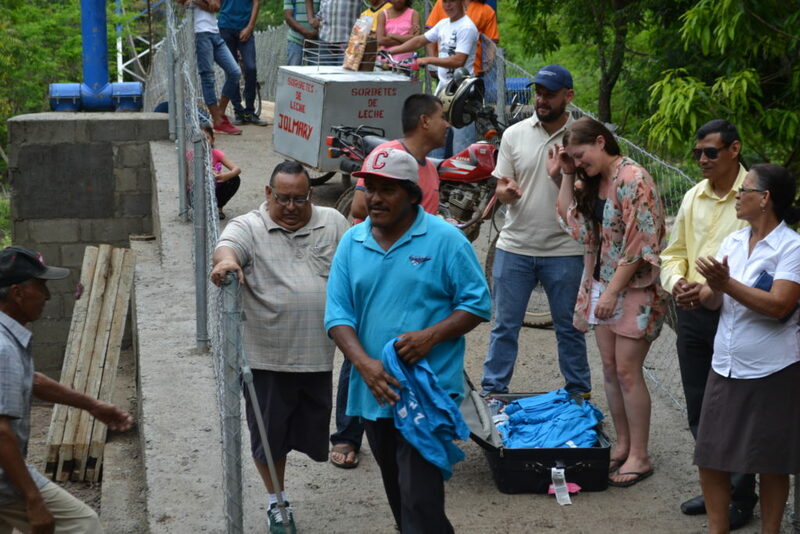 We have had such a good time building the bridge, and the community continued to show us open arms until we left El Riito. The night before inauguration we were invited to a show at the community’s elementary school. The locals cooked fried tortillas and bean salsa for everyone in attendance. There were about 50 locals in attendance plus the 10 team members. When we got there we had no clue what we were in for, it was such an awesome surprise. The kids in the community had been practicing some traditional dances for this show. It was so interesting and so cute! They went on for about 20 minutes, and got a roaring round of applause after they were finished. After the kids were done with their show, it was time for us to embarrass ourselves. We all tried our best to dance to some Latin American hits, most of us failed miserably. The rest of that night was a blast. We hung around with the locals, played some soccer in the streets, and really just got to relax. It was one of the few times we had nothing to do and just got to connect with the community. Playing soccer with the locals was tough though, they know what they’re doing! Inauguration was supposed to start at 9am the next morning, it started around ten instead. We’ve learned while we were here that “Nica time” is real and everyone kind of just goes at their own pace, even if they’ll be late. Anyways, the Inauguration started and it began with a prayer from a local pastor. 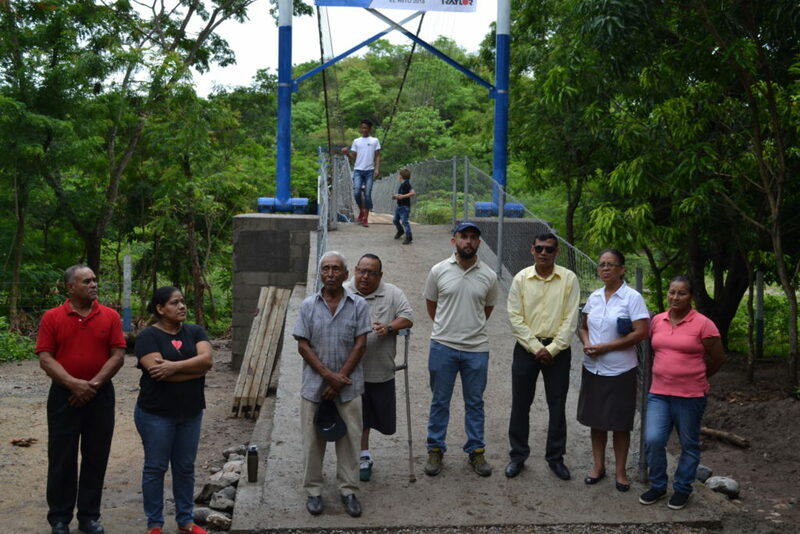 After the prayer, local community leaders from the city of Palacaguina, including the deputy mayor spoke a few words about the hard work on all fronts to get the bridge done. 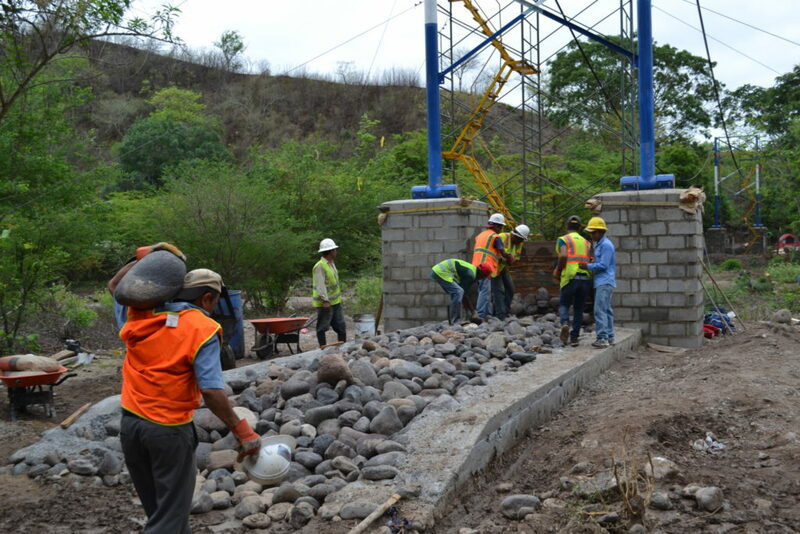 The community, the government, bridges to prosperity, and our team were all praised by the city officials. Leaders from the community of El Riito came up afterwards and spoke about how much of an impact the bridge will have on the community. They spoke about how kids will be able to safely get to school, and adults will be able to safely get to work. The community leader left us with this last sentiment “you aren’t just leaving behind the bridge, you guys are leaving behind friends in El Riito”, he told us we are always welcome back with open arms. I thought that was really sweet of him to say, and I think the team would feel welcome back in El Riito , even if we were to travel alone. Julio and Marysa spoke after the community leadership. They were both very well spoken and articulate. They spoke about how grateful we were to have this opportunity, and how gracious the community has been to us. Julio had collected a list of all the names of the locals who were dedicated enough to help us most of the days on site. Julio read off their names, while Marysa handed them each a shirt we had made to commemorate the occasion. You could see how much this meant to some of them. To be acknowledged for their hard work in front of the community clearly meant a lot. Some of these people gave up on opportunities to make money for two weeks in order to better their community, they were a dedicated group. The inaguration ended after all the shirts had been passed out. It was really starting to set in, this was the end of our journey in El Riito. There was one order of business to take care of though, Marysa had been planing this all week. 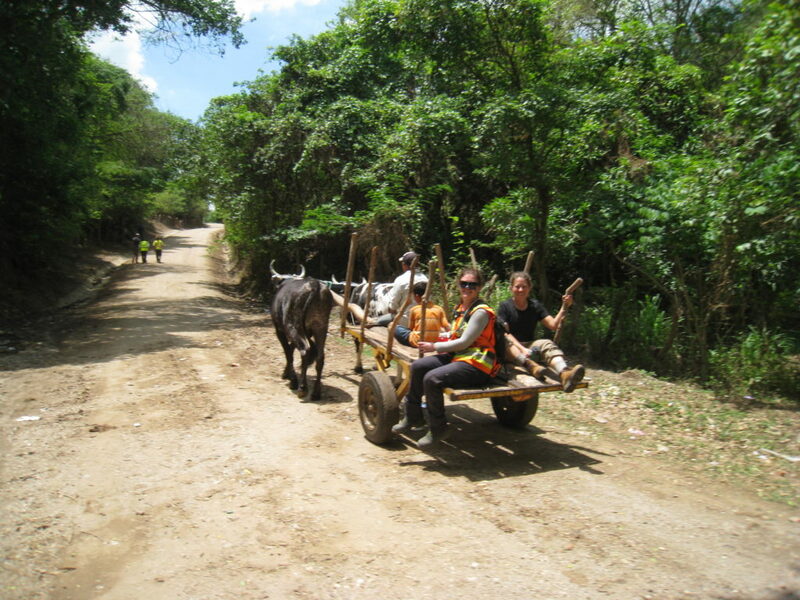 We stuck around a little while longer in order to say goodbye to the locals and everyone who had helped along the way. 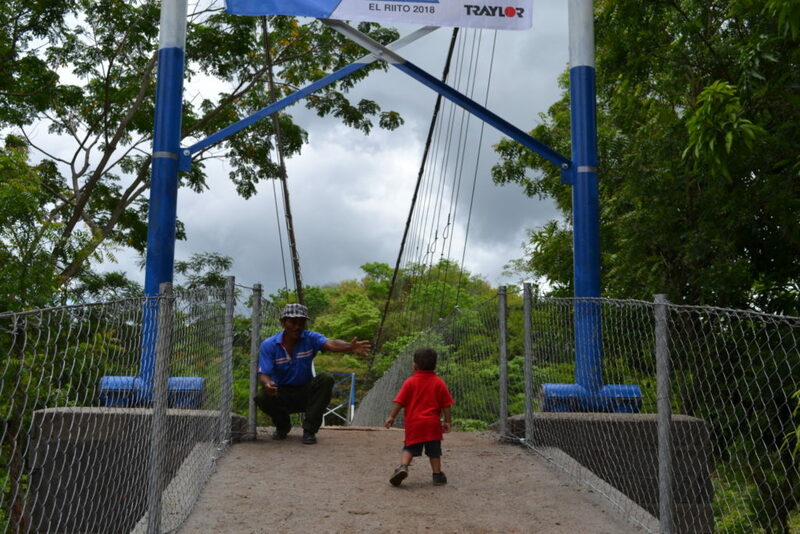 It was great to see the local kids loving the bridge, I hope they get to use it for years to come. 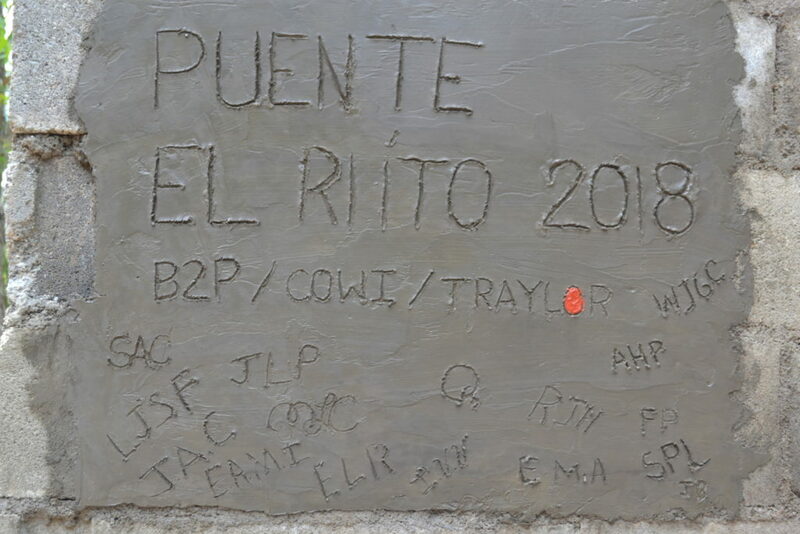 With that, our work was done in El Riito. It was a sad moment driving away from our build site for the last time. All the great people we had met over the last two weeks, we had to leave behind. 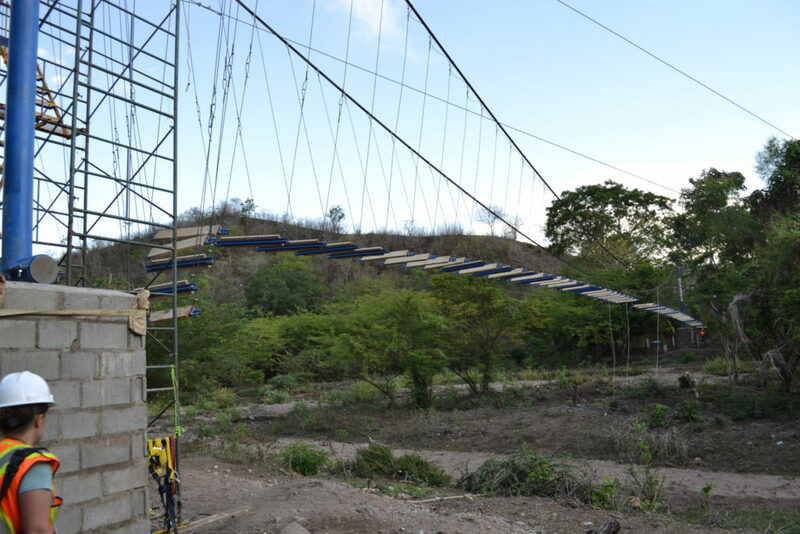 It was up to them now, the bridge was built, they have to make sure it stays maintained and in functioning order. B2P will help on that end as well. What an experience that was. 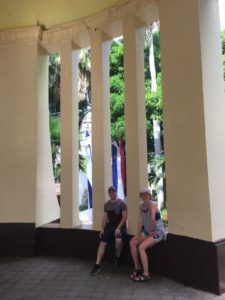 Some of us were experienced travelers before this, and some this was their first international trip, but for everyone this was an eye opening trip. 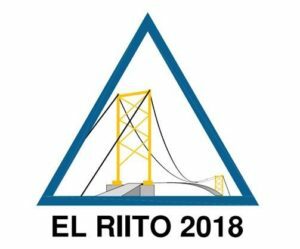 The community of El Riito is full of beautifully vibrant people who have so much to offer. 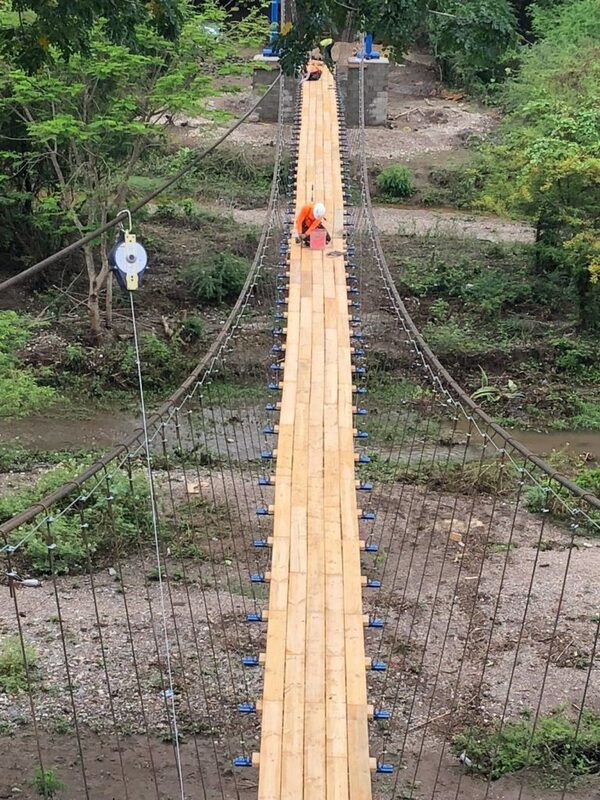 I hope now with this new bridge, their community can flourish beyond belief. Our journeys back home began for some on Saturday morning, some on Sunday, and a small group is sticking around the corn islands for an extended vacation. Safe travels to everyone! Through the long work days and mild sickness, the days have started to blend together. The blog is going to follow suite! A few of the team members, including yours truly have been battling stomach issues and low grade fevers for a few days. Our work hasn’t suffered but the blog definitely has. I believe I left off on Monday where we had about 75 percent of the fencing done on the deck. First things first on Tuesday we had to finish our fencing so we could walk across the bridge without fall protection! It only took a few hours to finish up, It was a great feeling to get that done, no more pesky lanyards and harnesses. 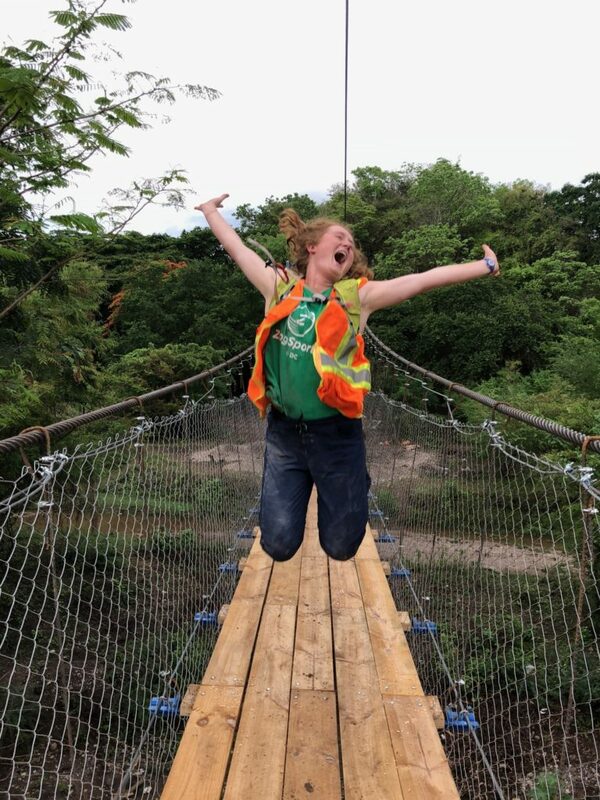 Shae was so excited to finally be able to walk across the bridge without fall protection! 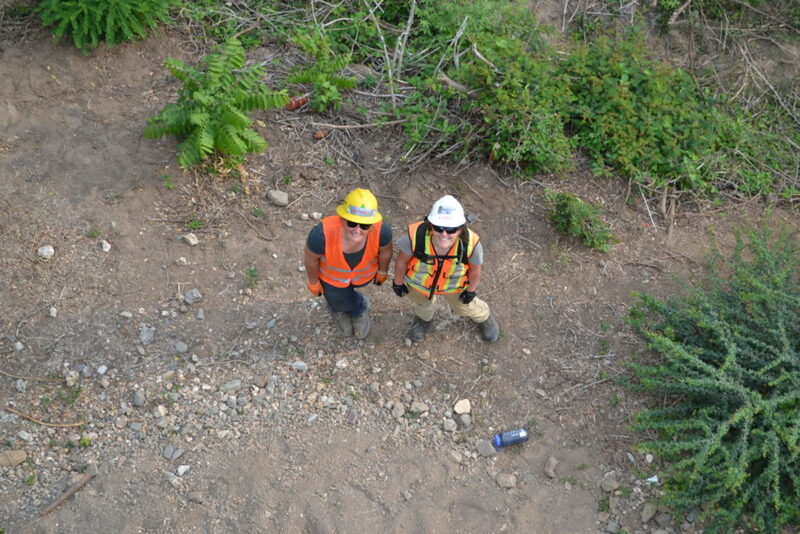 Some of the team hanging in the middle of the bridge. So I guess you could technically say our part of the bridge was done on Tuesday, abutment to abutment, which is always a great deal. 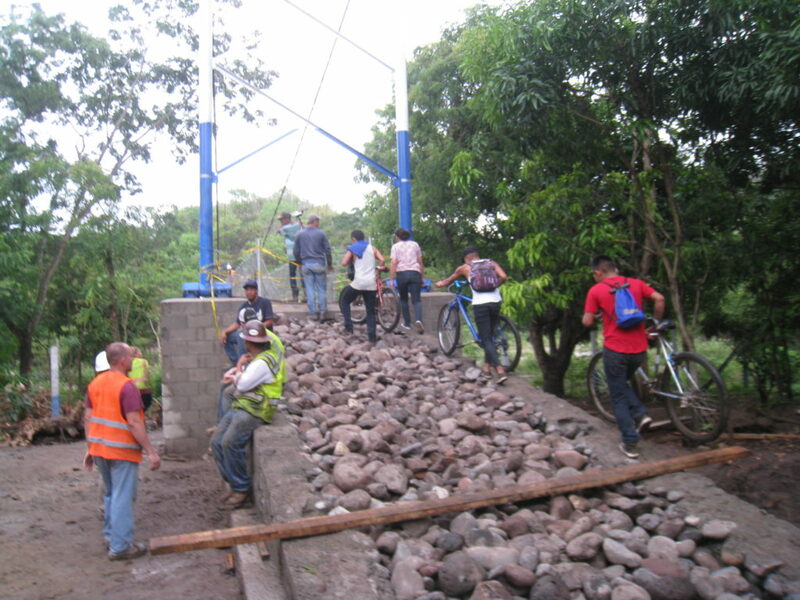 However, there was more work left to do, and our team was going to make sure the ramps got done before we left. We needed rocks, and a lot of them. 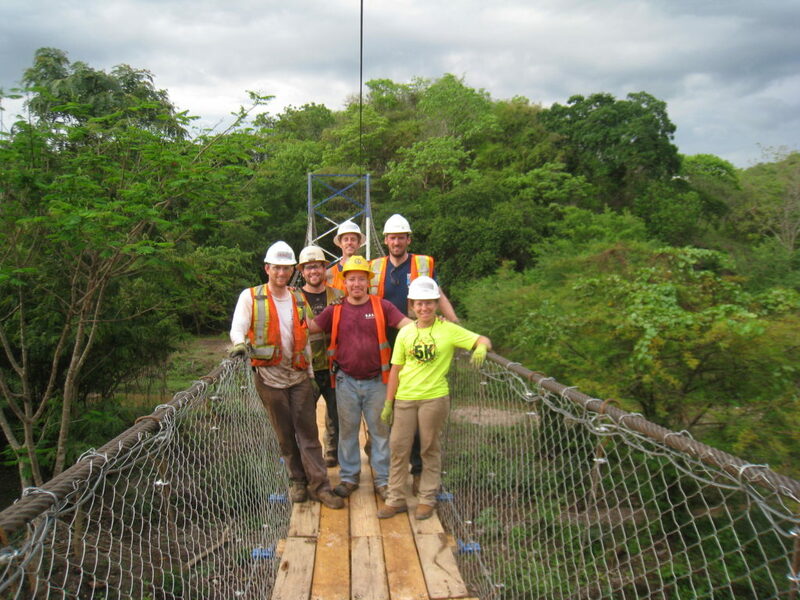 After the superstructure of the bridge was done, literally all we did for 2 days was find rocks, load rocks, and unload rocks into the ramps. It seemed like we put at least 10,000 rocks into those ramps. Everyone is feeling like a body builder after these past few days. Every day was leg day. 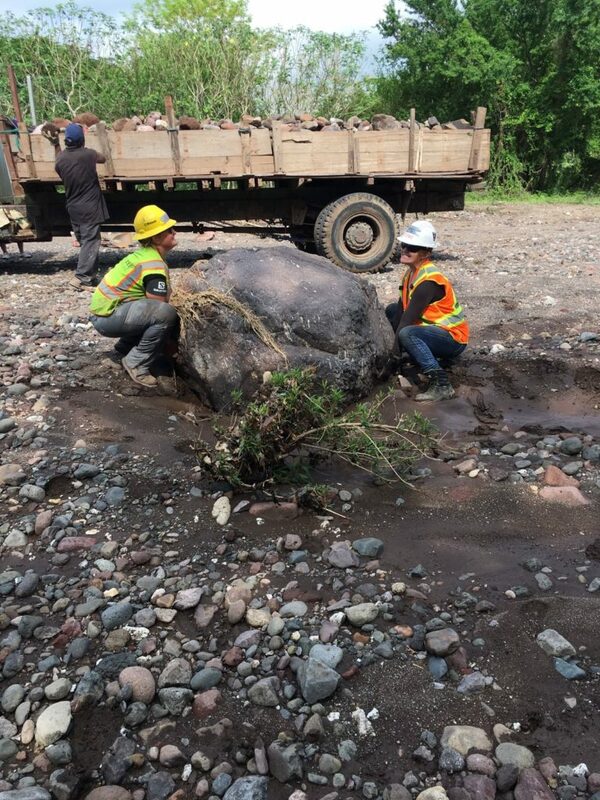 Some local guys helping us load rocks. Lift with the legs man! At the end of the day on Tuesday we counted 12 truckloads in the pickups to fill up the rack truck the town brought along. That’s some hard work right there. 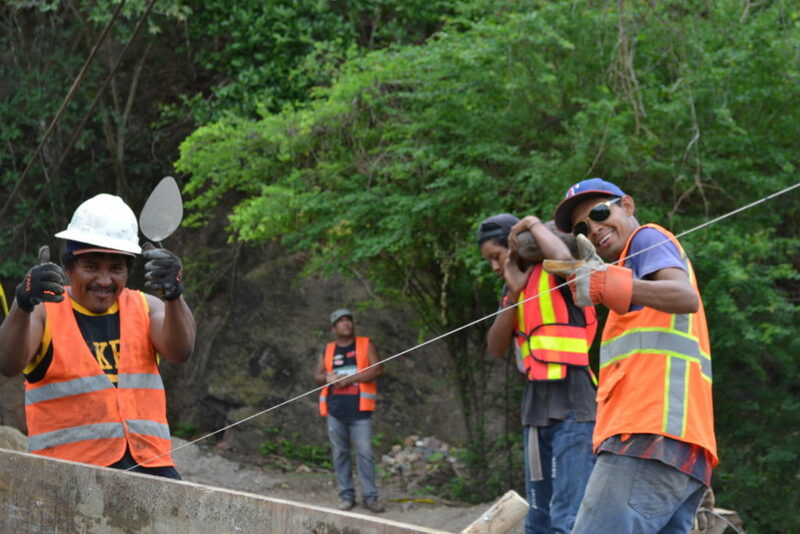 Julio and his team also got yelled at by a local for pry baring rocks off of the river banks. Apparently that’s illegal here. After a heated argument they settled on letting us grab rocks which were loose already. Easier for us! By the end of Tuesday we had just about finished filling the South side ramp with rocks. It was impressive progress for the day. The North side was a lesser challenge because it had already been halfway filled by locals. That was the challenge for Wednesday. We needed rest before we could that challenge. Final grading on the South slope. Look at all those rocks. Also we weren’t done yet but couldn’t keep people off of it. Very encouraging. Dinner was pretty typical on Tuesday, except for the fact that Marysa learned to ride a motorcycle. She borrowed Sonya’s for a little ride! She might go for a nice motorcycle ride over the bridge, Evil Kenevil style. Wednesday was pretty boring. More rocks. We ended up pouring the concrete for both the ramps though!! Ramps are pretty much done!! Wednesday dinner was awesome – Julio stopped by a bakery in the nearby town of Somoto for some Nicaraguan style cookies. Muy delicioso. Thursday was our last day of construction, it was bittersweet to put the finishing touches on the bridge. We put the fencing up on the ramps and made a little plaque for the bridge build. Our ramps are done! That’s all folks! Our bridge building has come to an end. Bittersweet is really the only way to describe it. We’re all glad to be done with the long days and sore bodies. 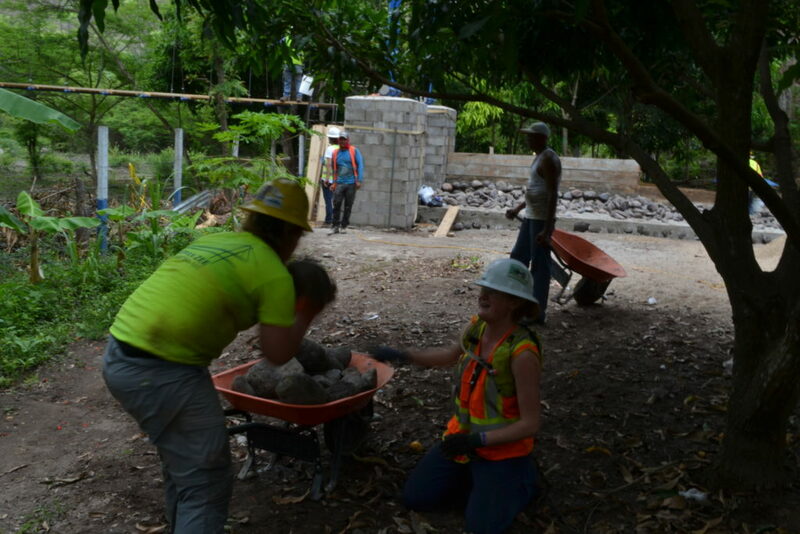 But we’ll miss working with the locals and having fun together in Nicaragua. This was the experience of a lifetime. 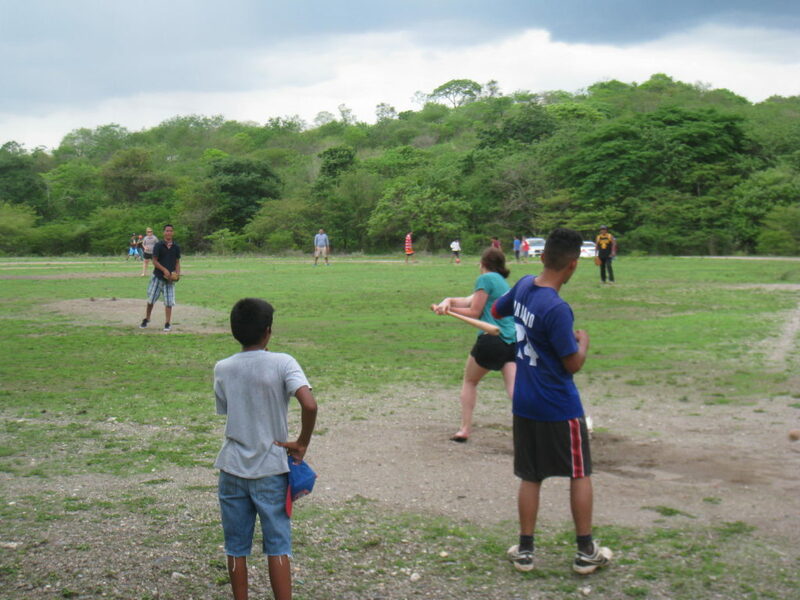 We had a blast playing baseball with the locals afterwards though. About 20 community members came out to this hidden gem of a field down the river from the community. Marysa hitting a blast! Homerun! Keep an eye out for a post about the inauguration tomorrow or the next day. I should have time to write a more thorough post while I’m waiting for my airplane back home. There’s so much to write about but so little time while we’re running around Palacaguina. Back to work! Our “day off” is over and most of us are more sore than the start to a normal work day, well worth it though. The bridge was waiting for us. 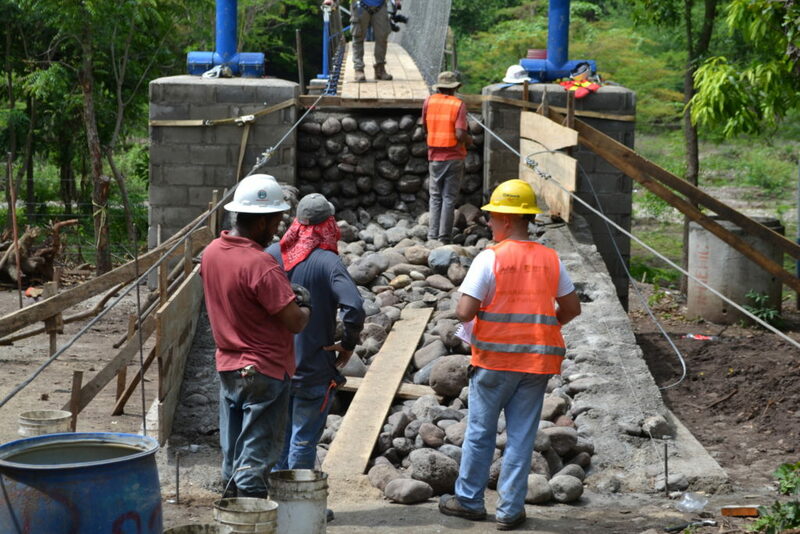 It’s only day seven of construction, and our first task for the day is to close the bridge!! The team broke up into two groups; bridge people, and ramp people. Marysa jumped the gun, said screw the rocks, and was harnessed up before stretch and flex! Can’t blame her though, moving boulders was no fun. 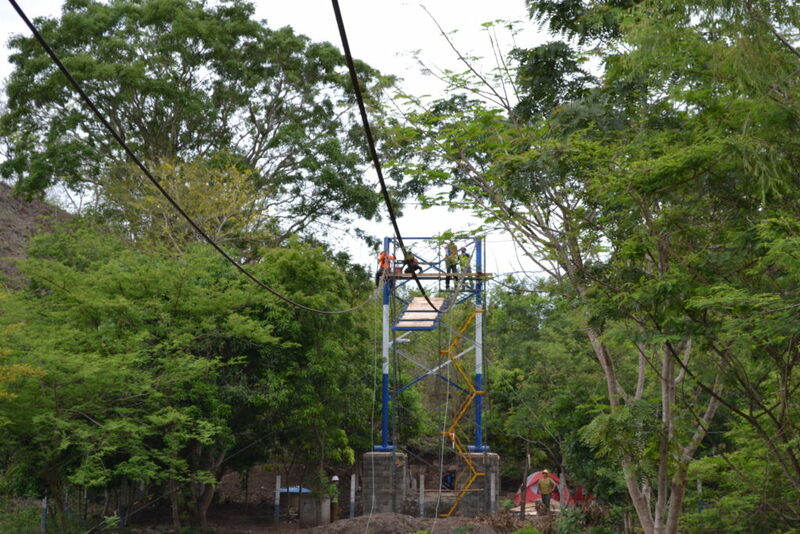 The superstructure for the bridge is almost done. All we have left up there is the fencing, the cables which run through it, and a pair of spanner cables underneath the deck which are supposed to help with movement from the wind. These proved to be tedious tasks, nailing in the chain link and weaving the cable through every loop took a fair amount of time. 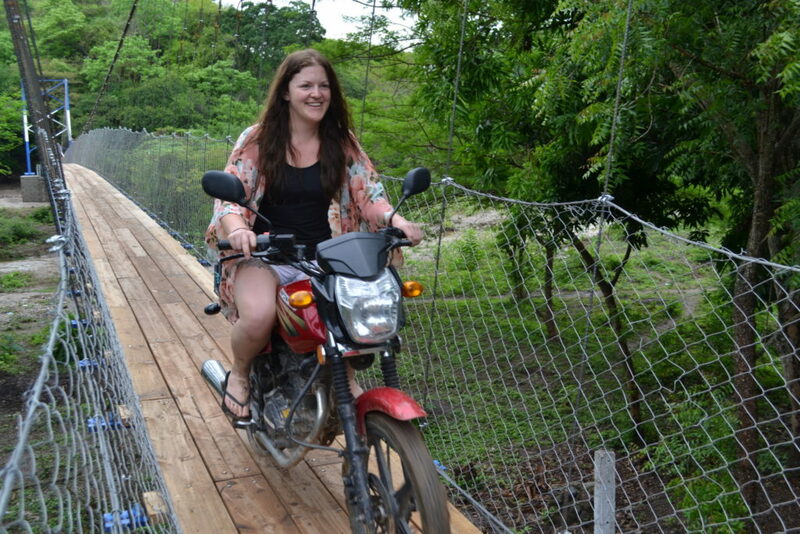 Between struggling with sheared off U-Bolts, deformed U- Bolts, mis-matched sizes due to lack of materials, and running out of chain-link fence, no body had an easy day up on the bridge. Marysa learned a lot of Spanish today up on the deck, just not how to differentiate any of it, U nails, Crosby Clamps, U Bolts — everything is a clampa! 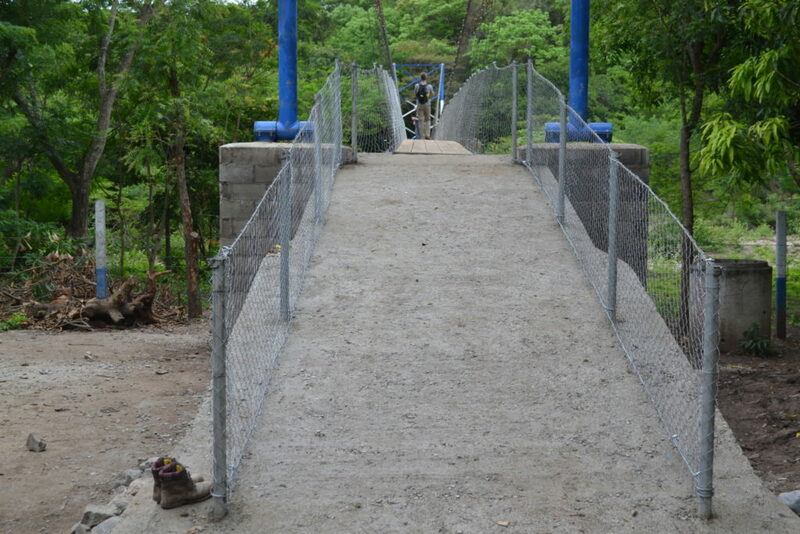 We finished about 3/4 of the bridge safety fence, and will tackle the rest tomorrow. 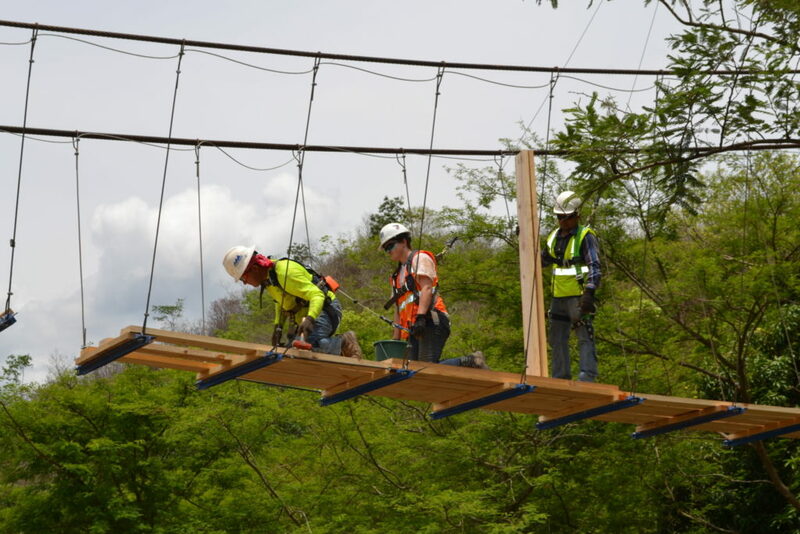 We can almost walk across the bridge without fall protection! 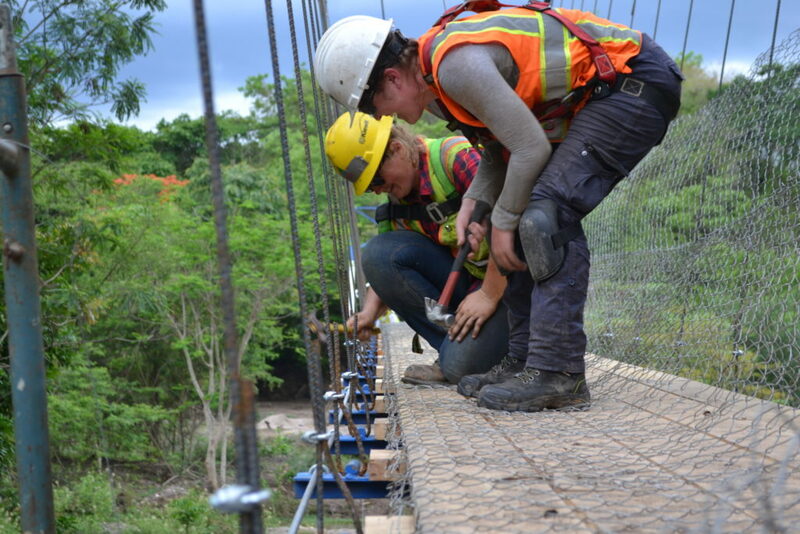 The second team broke off and had a few major tasks, which were less glorious than bridge work. Task one – fill in the rest of the excavation for the north side anchor beam. Task 2 – move what seems to be thousands of rocks to use as the base for the ramps. Both tasks were equally grueling. We decided to try and tackle the excavation first. No pictures of this one – but you can imagine how it goes, shovel fill into a wheelbarrow and dump into a giant hole, over and over and over again. Right as we were getting finished the ice cream guy came by with some well deserved chupetas. The whole dirt moving team was exuberant. 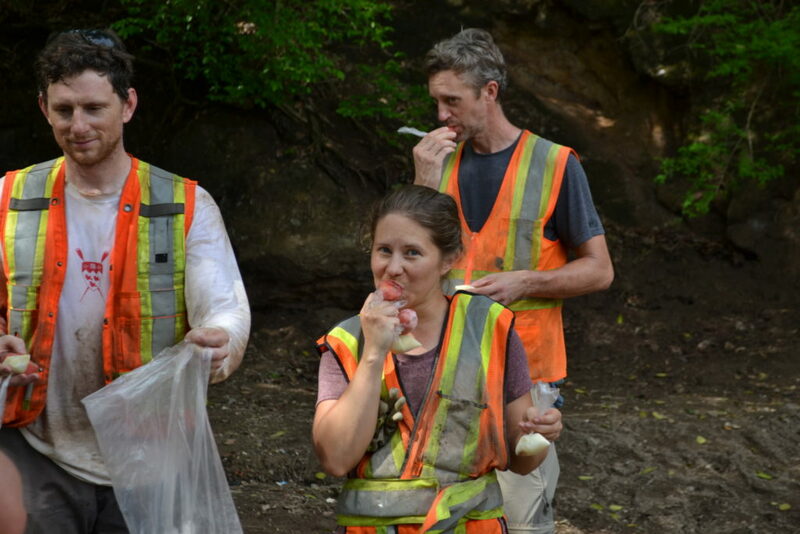 After we all had our fill of chupetas, the real work started. 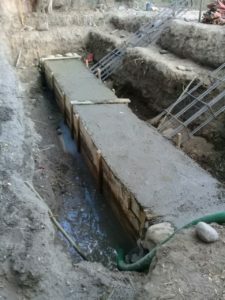 We had to fill in both the ramps with enough rock to use as a base for the concrete face of the ramp. This means about 9 feet high at the top of the ramp, and around 6 feet wide. Mucho rocks. We had some help from some of the locals on the south side ramp which helped greatly. It was a pretty entertaining mix of people. The usual 4 or 5 local guys were there, but two new faces showed up. One was a 22 year old guy – who looked like he was 17, and one was a woman probably around 50. The younger guy immediately became infatuated with Shelley and the woman kept egging it on. He was showing Shelley how strong he was by adding extra rocks to his wheelbarrow, and the lady kept giving him words of encouragement to win Shelley’s heart. Pretty funny stuff. I don’t think the feelings were mutual on Shelley’s part though. Poor guy. The south side ramp. Still lots of rocks to go. A side note: our video guy, Andy Yardy, showed up today. He’s going to help document what’s left of the bridge build, and the inauguration on Friday. I’ll try to steal some cool content from him to put in the blog. Stay posted. Dinner was well deserved after a day of nailing in fence and moving rocks. 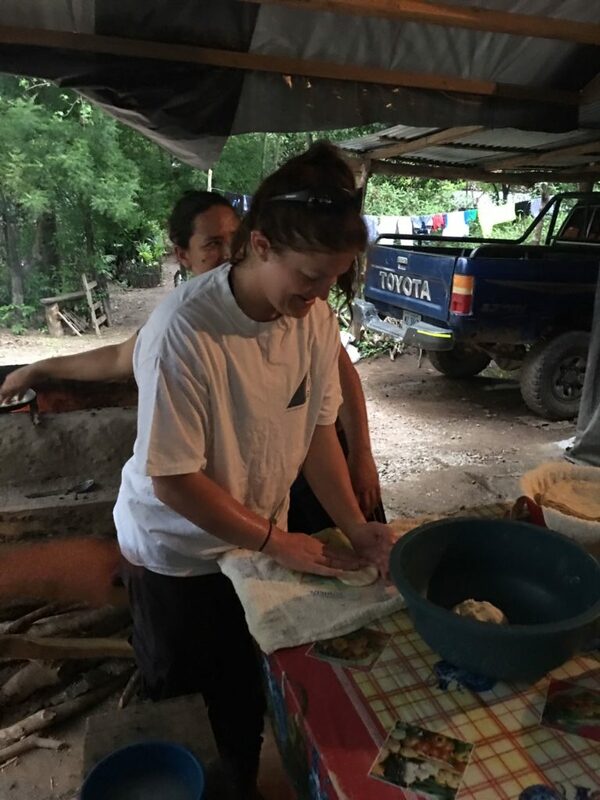 Marysa got up to the house early and even got to help our cook make some tortillas! Marysa making the team tortillas. She better have washed her hands! Our Somoto Canyon adventure has come and gone. Let’s just say it’s a memory none of us will soon forget. We woke up for a 7 am breakfast, which was a pleasant change from our 530 routine. We packed up and waited for B2P volunteer Calvin, and Sonya, our favorite local, to show up. Our journey out to the canyon began around 830 am. Our foreman Efren hooked us up with a couple local tour guides for a discounted price of 12 dollars for an all day adventure, not bad! We headed out to the Canyon with the intention of floating down a lazy river in tubes all day. We stopped by a local grocery store and picked up some snacks, cervezas and water. When we got to the tour guides house, they briefed us on a couple of options. We chose the longest float/hike hybrid, we were all ready for some leisure!! We floated and hiked all the way from point 7 to point 1! The first leg of the journey from point 7 to point 10 was just as imagined. A beautiful scenic hike paired with some easy going river floats in our life jackets (no tubes like we imagined. 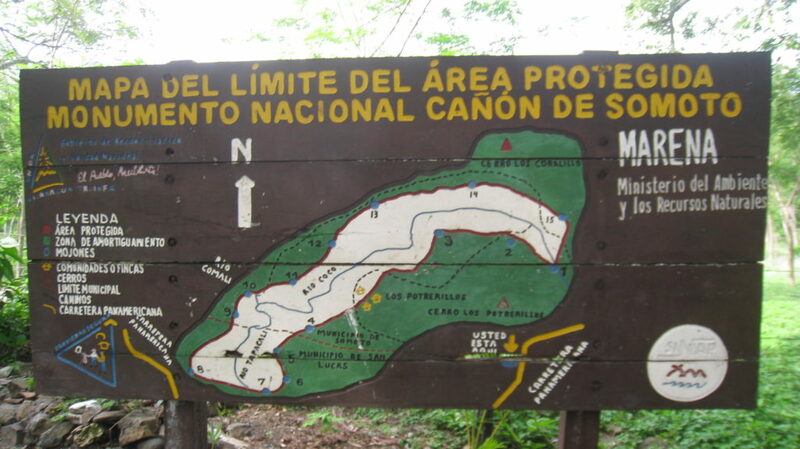 We took a break around point 10 right were our river met with another river coming down from Nicaragua. We drank a few beers, ate some snacks, and some of us cliff jumped on this cliff right near by. 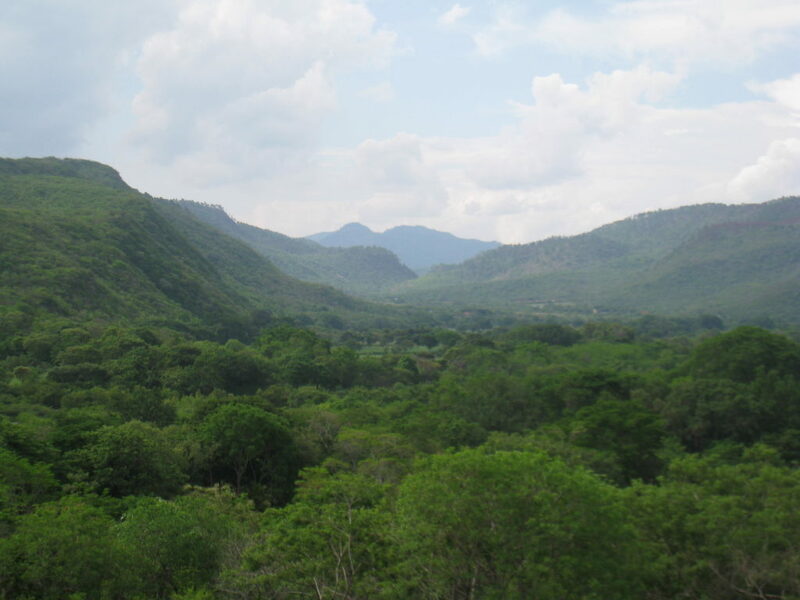 A side note ,this park which has so much natural beauty, was only discovered officially 12 years ago. Pretty crazy stuff. Also sorry for the lack of pictures, the water was prohibitive for my camera. Shae showing us how a cliff jump is done! We packed up, and were on our way down the new river in about 30 minutes. This is where it all changed. Keep in mind when you read this part, none of us got hurt (badly), and the tour guides knew what they were doing. The first thing we noticed in the new river was that the current was much stronger and much faster. We hit a little set of rapids about five minutes in, and just surfed on our butts over them. At this point we were all thinking, “What did we sign up for?”. We knew our leisurely trip was over at this point. The first point where I thought I was close to death, I’m sure more than a few of my teammates did as well, was when we couldn’t pass around a set of rapids on land, because the canyon was too high. Instead we had to clamor to a big rock on the side of the rapids while half submerged, into a little alcove with calmer waters. My grip started to slip at one point, and I thought I was going to be sucked into these rapids, never to be seen again. We all made it, and the adrenaline was pumping after that situation. 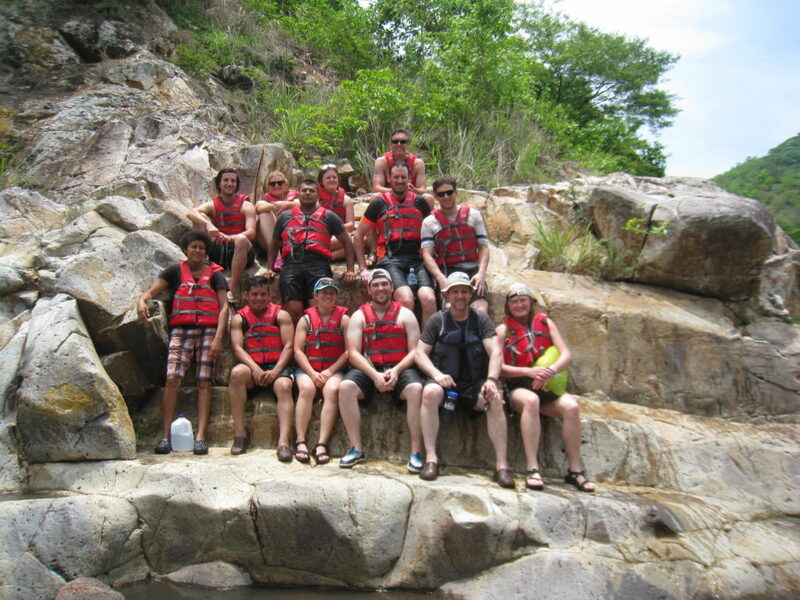 The most exhilarating moment of the trip for most of us was when we pulled up to a small island of rocks, right before a set of rapids which were extremely fast, strong, and rocky. Our tour guide told us to do exactly as he does, hold your breath, and dive head first into this specific spot in the rapids. When we jumped in those rapids, we were at the complete mercy of the river. No amount of strength of swimming knowledge would help. It sucked us down, hard, and flung you around like a rag doll. About 10 seconds later, which felt like an eternity, we popped up about 50 feet downstream in calmer water. Some of us were scared initially, but the team helped to push people past their comfort zones and brave the unknown. I was personally in awe, of how awesome, and exciting that adventure through Somoto Canyon was. I know those are some memories none of us will soon forget. Helping each other muster courage, and laughing and screaming at the ridiculousness of our canyon expedition are some of the best memories I’ve made on this trip, and I’m sure the rest of the team would say the same. 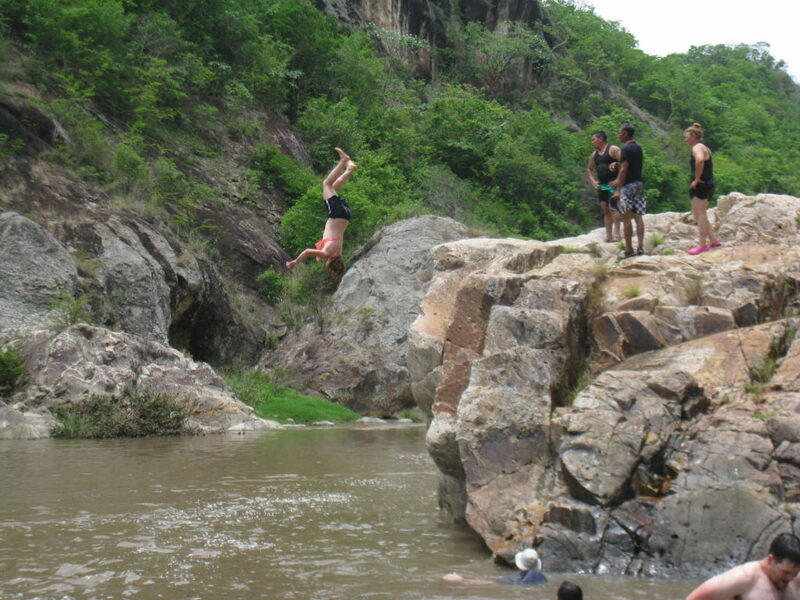 Accidentally signing up for a daredevil canyon trip was a great choice! We cliff jumped some significant heights on the way back, upwards of 30 meters, which in my opinion wasn’t even half as crazy as the rapids jumping. and finally met up with some more tour guides in row boats who brought us back to the bottom of the massive hill which our truck was atop. We walked up the the hill and stopped for probably forty chocolate covered bananas at this little shop half way up. Only $1.50 American, this place is awesome. Never forget. 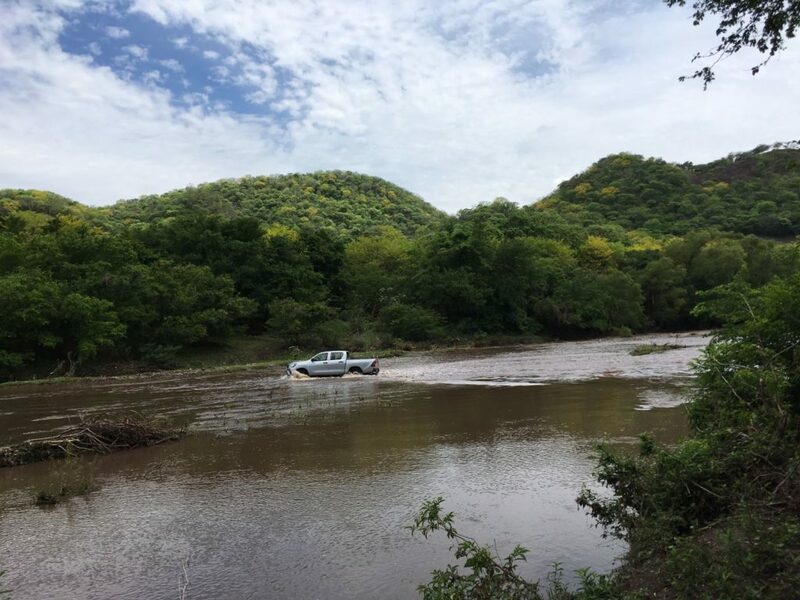 Somoto Canyon trip 2018. Day 6, morale is low, can’t go on. Just kidding! 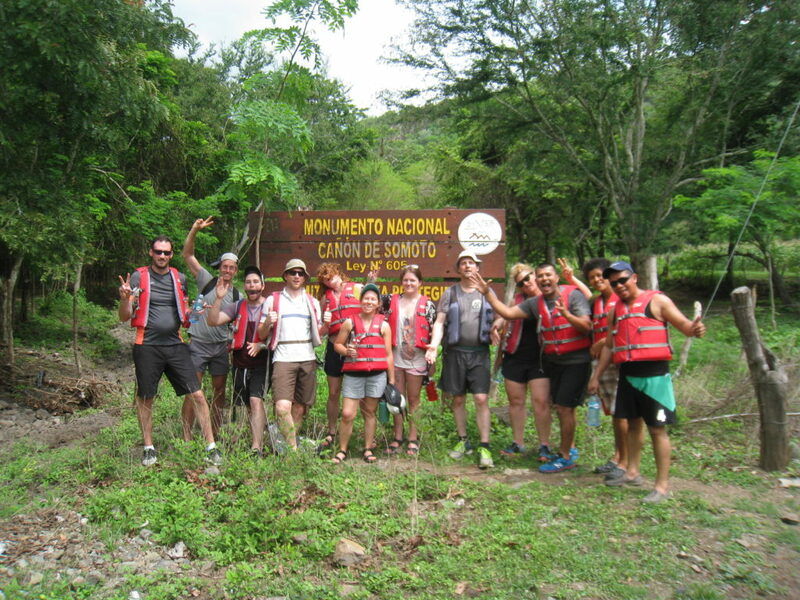 Actually morale is at an all time high, only one more day before we have a day off to explore Nicaragua, word on the street is we’re going tubing at Somoto Canyon. Our bridge is seriously staring to take shape. After yesterdays progress, all we have left is deck boards, fencing, ramps, and finishing touches. not bad for one week! Incredible what can happen when a group works towards a common goal. Typical start to the day, stretch and flex, tool box talk, and all of that good stuff. 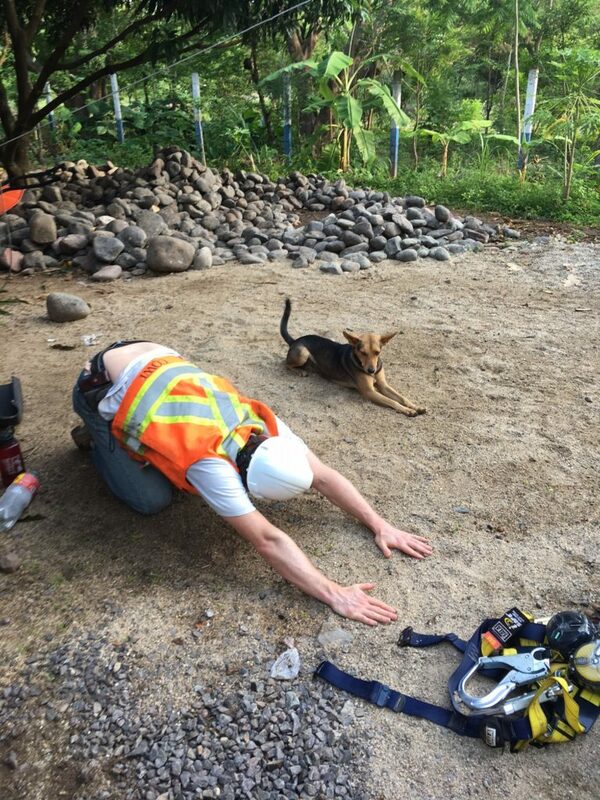 This dog was showing James some new stretches. I think this one is called the downward dog? The hangers are all set, so the first step was to stage the deck boards which were being cut by Shelley, Shae, and Aaron. James, Shelley, and Julio making some progress on the other side. Hoping to meet Ivan at center span by the end of the day. 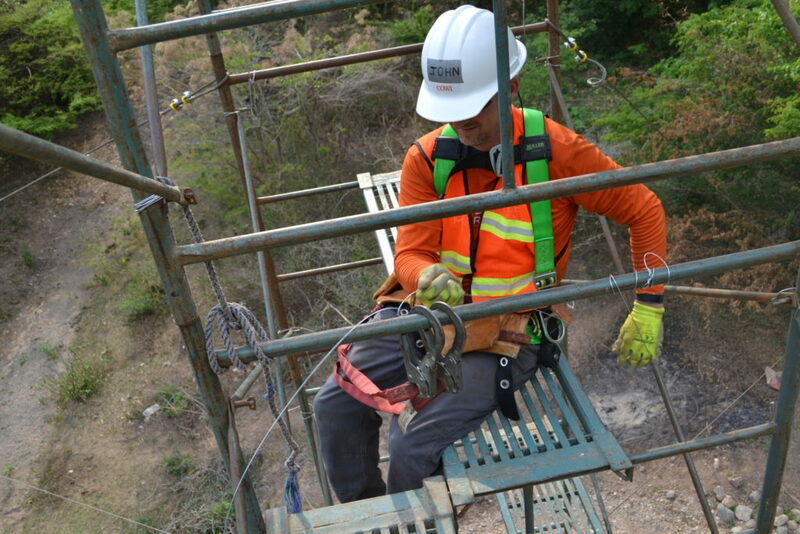 We only have enough specialized fall protection equipment to have 6 people up on the bridge. Since that’s the only critical path work going on right now, some of us have been assigned to less glorious tasks, like moving boulders for the ramps. We’ve been lucky so far with the rain. It usually comes at night after we’re done working. 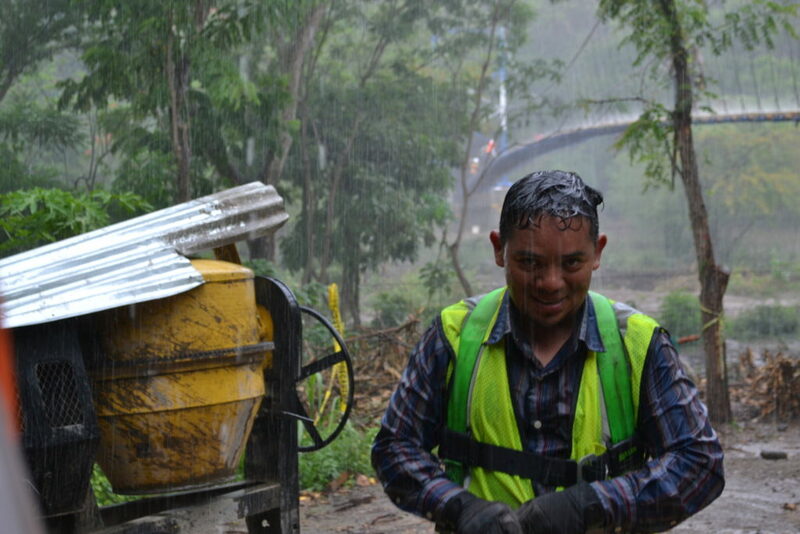 A torrential downpour came right as we were placing the planks for the closure. It was too much to finish it in that rain. While we wanted to be able to say we closed the bridge in a week, we just missed it. Everyone was a little disappointed by that bad luck. I’ll let the pictures do the talking. 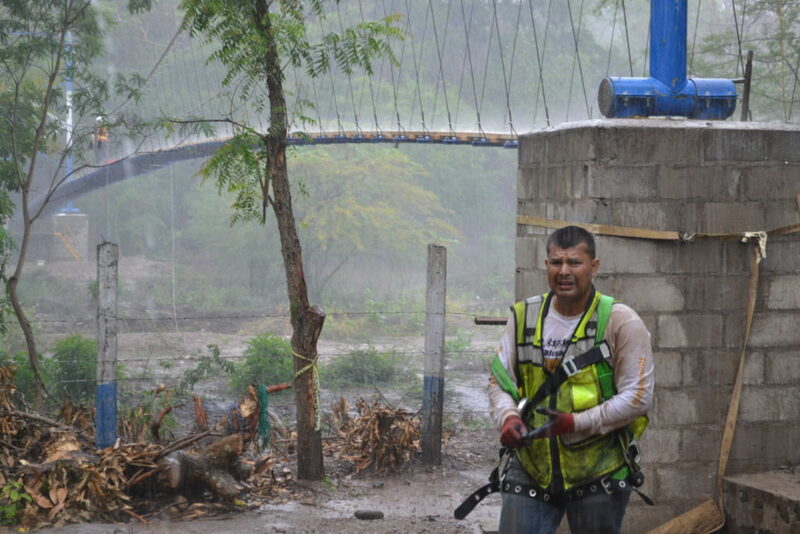 Our B2P Engineer Juan Carlos, soaked. Look at that rain. A man and his bridge. I don’t think anyone was more disappointed than Julio. The rain did not stop. We were forced to pack up for the day, without closing the main span. The river has been pretty dry thus far. Thanks to that storm we got to see a glimpse of why a bridge is needed here. This is only the beginning of the rainy season. I’ve heard from locals the water can get as deep as chest high. There is no other way to get into town. You have two choices if you live in the community of El Riito, stay at home, even if you need medical care, need to go to school, or need to work. Or you can wade across the river, sometimes with small children, in order to access community needs in the bigger town of Palacaguina, just across the river. I think i speak for everyone on the team when I say we are grateful to be able to provide safe access across the river. The work day ended on a bittersweet note. Not closing the bridge hurt, but we got a glimpse of the need for this bridge in person, that’s worth closing the bridge next week. Plus, no work on Sunday! Morale turned around quickly after a few cervezas. 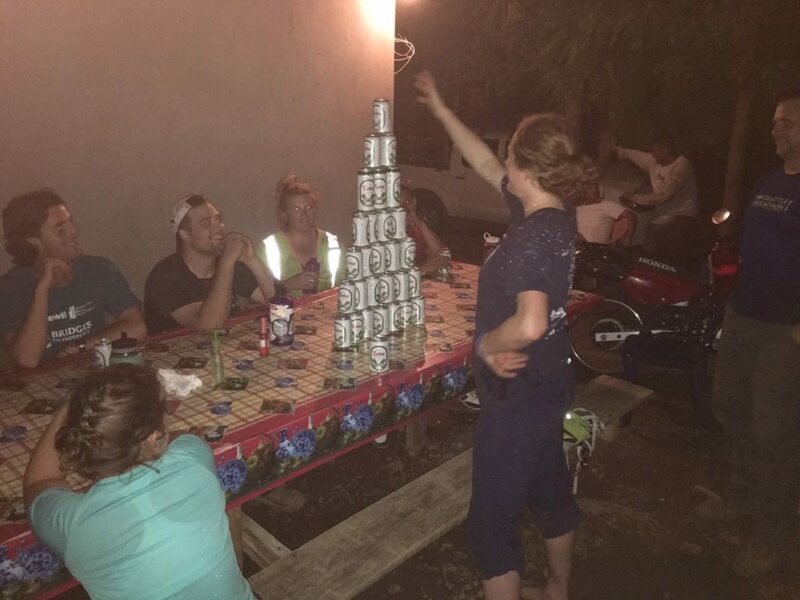 Shae topping off our Saturday night beer tower. Aaron and Shelley even got out around Palacaguina to explore a bit. 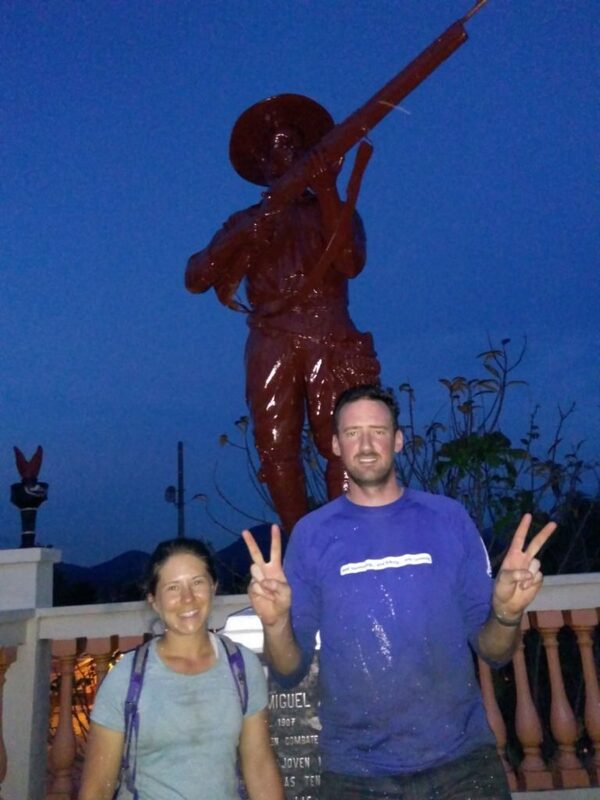 Aaron and Shelley in front of the statue in the center of Palacaguina. The statue is for Miguel Angel Ortez. A war hero in Palacaguina. So I’m still a day behind here on the blogs, but Julio is putting his whip away for tomorrow and letting us take the day off, so I should get caught up soon. Lets just say everyone is ready for a day off, some relaxation, and recuperation. We’ve all been working ourselves to the bone, and the results are staring to show. Yesterday, which was the fifth work day, we started off with our typical routine, which i’m sure you all know by now if you’ve read past blog posts. 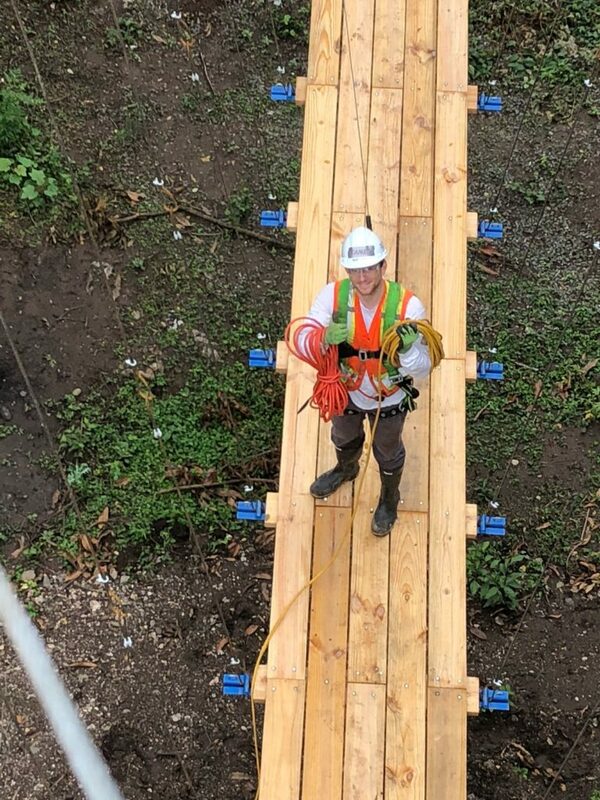 Our goals for the day were to stage all of the cross beams and suspender cables, launch them, and pull the safety cable across the top of the bridge for upcoming plank work. The next step was to hoist up the cross beams by the suspender cables and launch them onto the main cables, not easy work considering there are 74 of them. 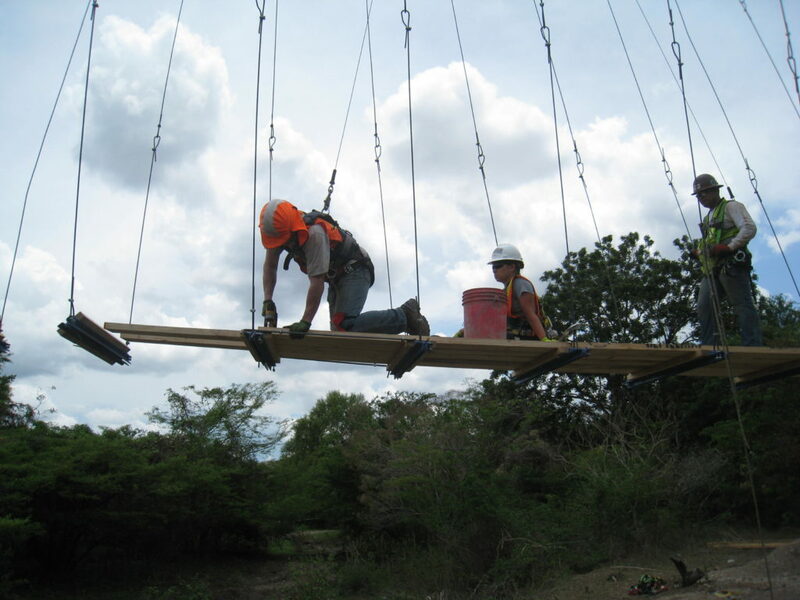 We had four people on each scaffold tower to hoist up the boards, and two people on the ground to tie ropes to the suspender cables for hoisting, and clamp the suspender cables onto the cross beams. 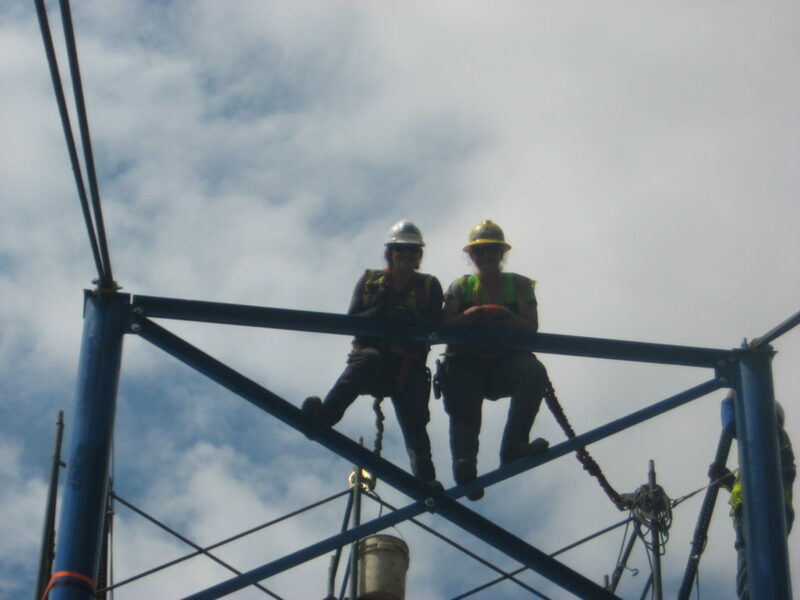 This task took all ten of our team members and help from our two B2P engineers and foreman. Some progress, on the other side. They’re beating us. must go faster. So remember when i said the ramps were supposed to be done when we showed up? They’re still not done. Our dedicated crew of locals work on them when we don’t need their help on the main span. It’s hard work, and I am always amazed how hard they work. There’s a possibility we could be done with the bridge before the ramps are done. If that’s the case, we’ll circle back and join forces with the locals to finish up after construction. The local guys are super fun to work with. Even though there is some pretty significant language barriers between most of us, we manage to laugh at each other. 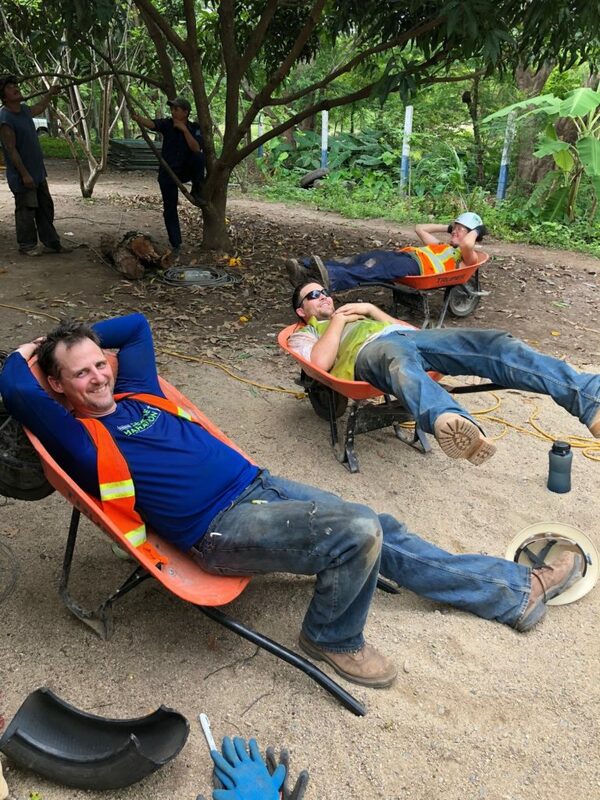 A hard day of manual labor always seems to bring that comradery along with it. Just today I found out that i kept trying to ask for the soap, referring to this bottle of Purell I leave at the lunch table, at lunch by saying “donde esta la sopa?”. Every time i said it the local guys kind of looked at me funny. Calvin, who is bilingual heard me this time and informed me that “sopa” means soup, not soap. So apparently I seemed crazy, or mad there wasn’t soup, every day. When we finally figured out what was happening we laughed for a good ten minutes, hahaha I haven’t laughed that hard in a long time. The work days can get pretty long, sometimes upward of 12 hours. We try to find some ways to break up the day other than lunch. Sometimes we send someone up to to town to get “chupetas” which are these small homemade iced treats which are home made in bags. Or sometimes the ice cream guy will come by, which is a joyous occasion. We were cautions at first to eat his ice cream because it could be made with local untreated water, which could have risky bacteria in it. Eventually the sweet cold goodness outweighed the risk. John and Skylar enjoying an ice cream form the local ice cream man. They cost about 10 cents a piece. Dangerously delicious. 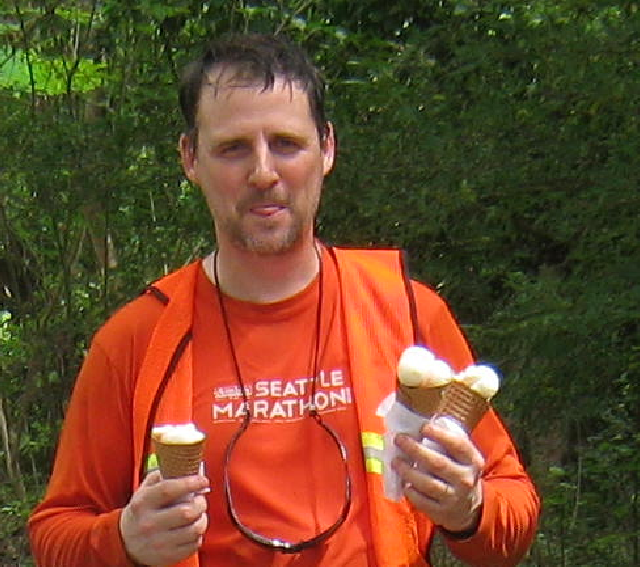 Three cones in hand, look how ready John is for that ice cream. After a long day filled with deck beams and ice cream, we’re finally staring to have a structure that resembles a bridge. Check it out!! After 5 long days of work, this is what we have, not bad!! Officials from the local community came out to show thanks and speak with all of us. Their gratitude was welcomed, and eye opening. Day four of construction is over, we’ve made some incredible progress since day one. Today we pulled the remaining cables over the towers. We also set the sag on the cables, and clamped them into place. Suspender cables are all done and checked for quality, and they have started to be staged with the deck boards. 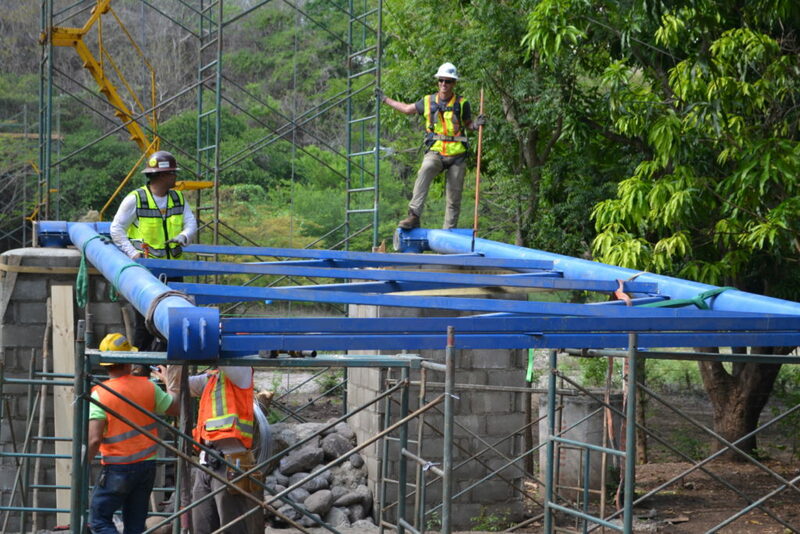 At the rate we’re going, it looks like we’ll finish the bridge two days before schedule, barring any major hold ups. Per usual our day started with breakfast outside of the hotel around 545 am, and leaving for site around 615 am. 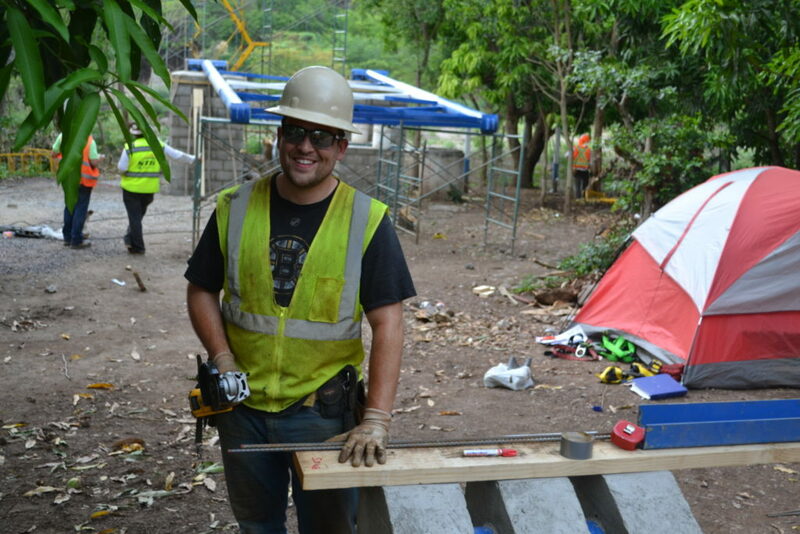 Julio runs the toolbox talk and leads us through our daily tasks with B2P foreman Ivan. 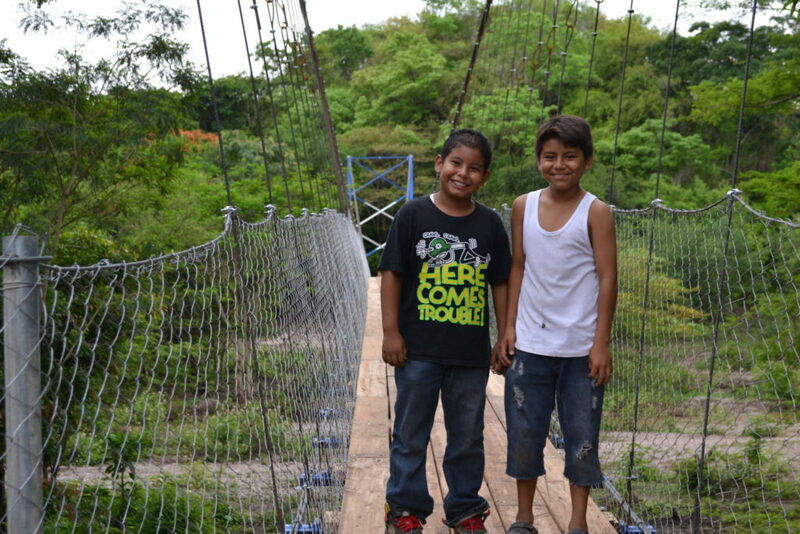 Our B2P staff has revolved throughout the job, we lost Francisco and Esteban to other endeavors. 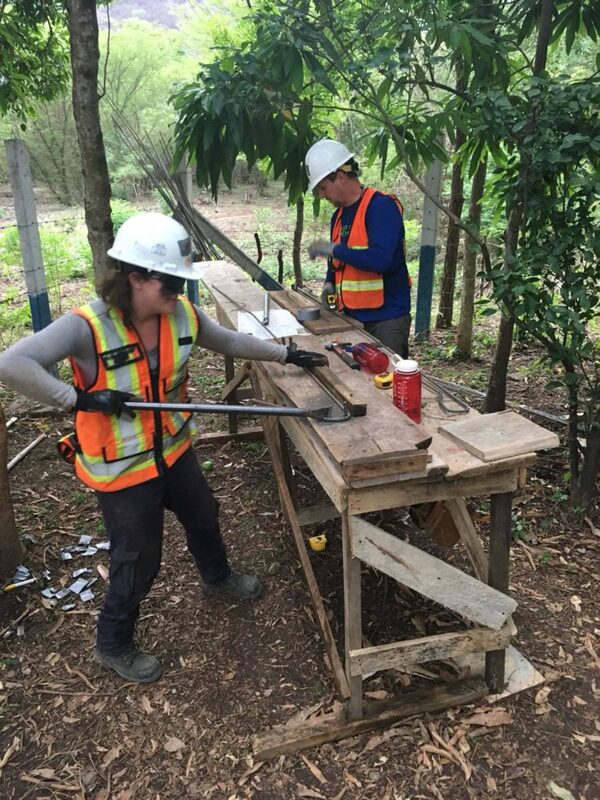 We now have an engineer from B2P named Juan Carlos and a volunteer engineer named Calvin. 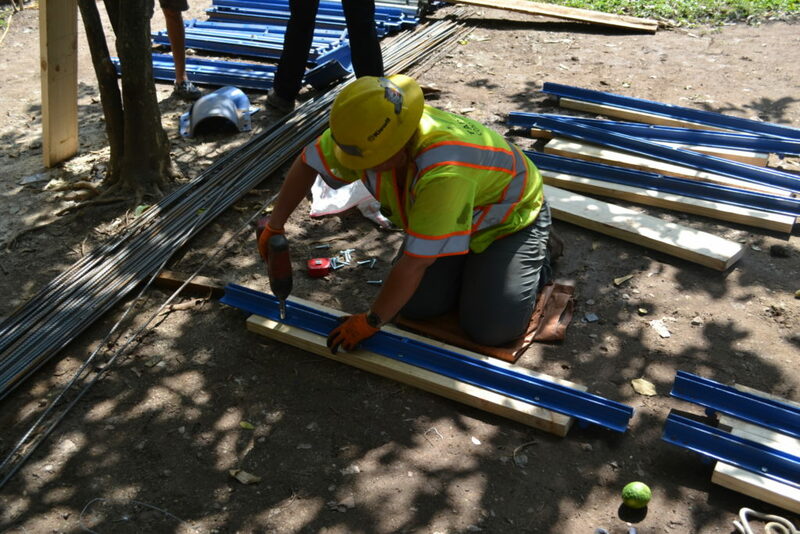 We’ve also lost some support from local community labor, the first day probably 12-15 laborers showed up to help. It seems as if the excitement wore off for them, we now only get a dedicated group of maybe 6 or 7 locals, their hard work is greatly appreciated by the whole team. Lived action shot of the team pulling cables. I swear we didn’t stage this picture. 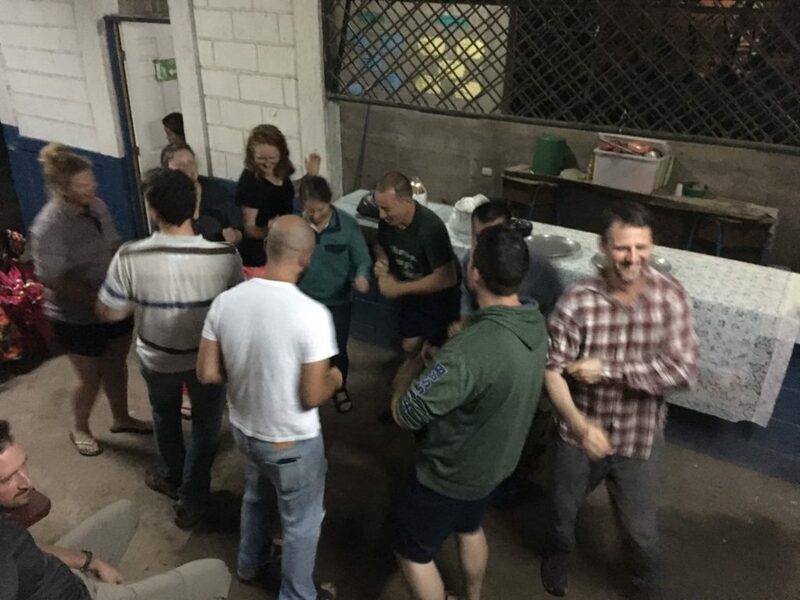 After a long days work and dinner at a house on the community of El Riito, we usually head back to the hotel and drink a few beers around a table and talk about our day. Yesterday a few engineers from B2P joined us and made the night that much more fun. Juan Carlos brought his guitar and sang us some Nicaraguan jams. He’s awesome on the guitar! Read the post from yesterday below – its finally up! Today started a little bit earlier than usual. Julio swears we’re behind schedule so we’re getting to site for a 630 start, SO glad he’s finally here. But seriously, our productivity is through the roof since he showed up. 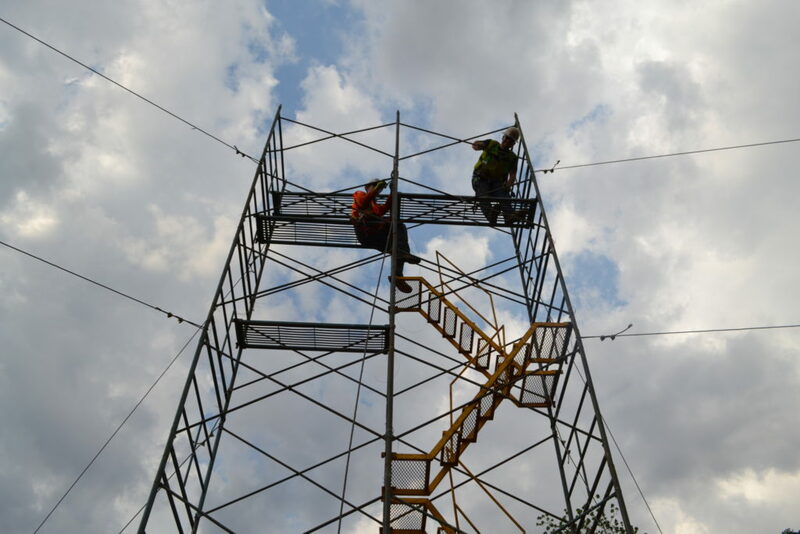 Yesterday we set up one tower and got it ready to trip, today we tripped that tower, staged the other tower for tripping, tripped the tower, and ran the two cables over the upstream tower leg, as well as continued work on suspenders and deck board pre-assembly. There was a bit of a learning curve with the towers, but we’re moving along at a blazing pace now. Watch the tame lapse below to see our first tower being tripped. The other side of the river was the exact same process, but I think we built it in about half the time after we got the hang of it. The towers were both upright by lunch today, pulling cable was the next step. It took most of, if not the whole team to complete this task. A team had to untangle these massive cables from the other 3 that were laying together, then straighten them out, no easy task at about 300 feet. Then a person down below would clamp the cable to a rope which was up with a team of three people on the scaffolding. The rope would be passed over the scaffolding so a team down below could walk with it in order to pull the cable up. The people on the scaffolding had the job of lifting the cable in to the saddle on top of the tower, trust me this is no cake walk to do by hand. We pulled the cables for one side today, the other side will be done tomorrow. Hola amigos, sorry for the lack of blog yesterday. I swear there’s an excuse though! I was writing the blog in a torrential thunderstorm and the internet cut out while I was uploading a picture. Google chrome didn’t like that, so it crashed along with the whole blog. Anyways, I’ll try to fill you guys in the best I can about the happenings the past two days. As usual, we woke up around 530, for a 6 am breakfast. 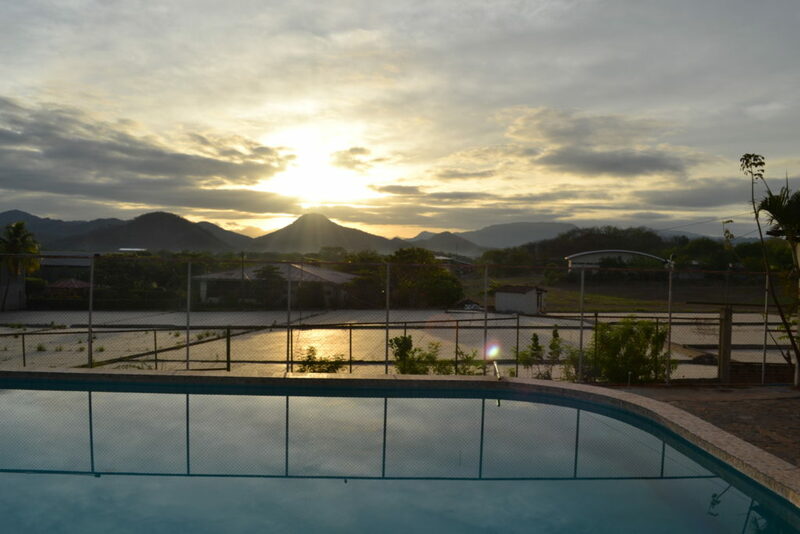 It seems like the sunrise in Placaguina gets more colorful and vivid each day. They make waking up for breakfast that much better. 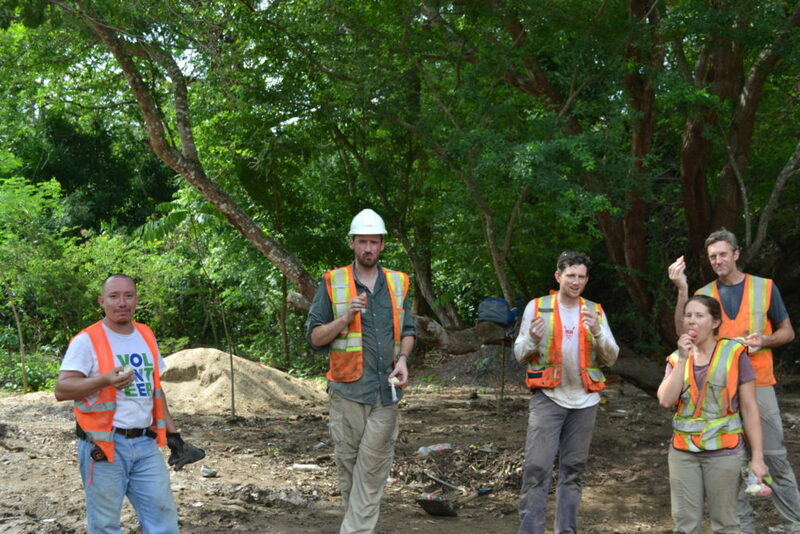 Yesterday started out with the usual morning toolbox talk led by Julio and Francisco. Our tasks for the day were tower pre-assembly , cutting and bending thin rebar for the 74 pairs of suspender cables, and pre-assembling deck boards. 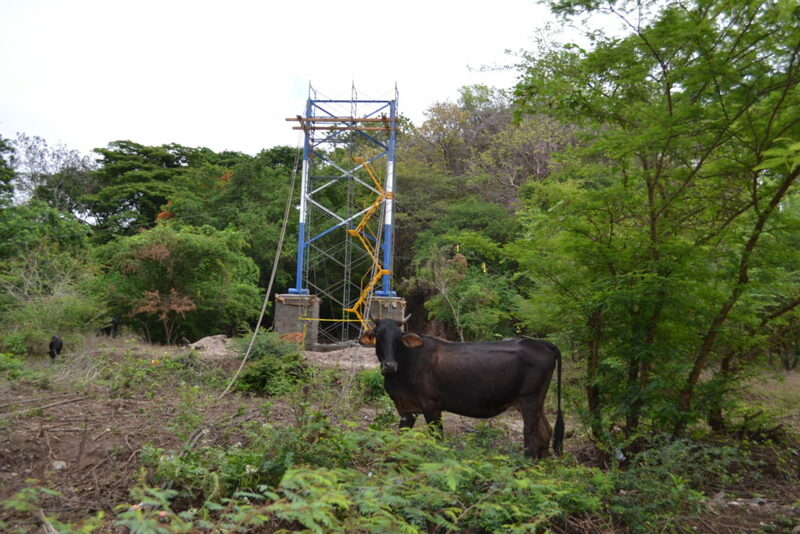 Pre-assembly and erection of the towers on B2P projects are usually aided by the bridge ramps. 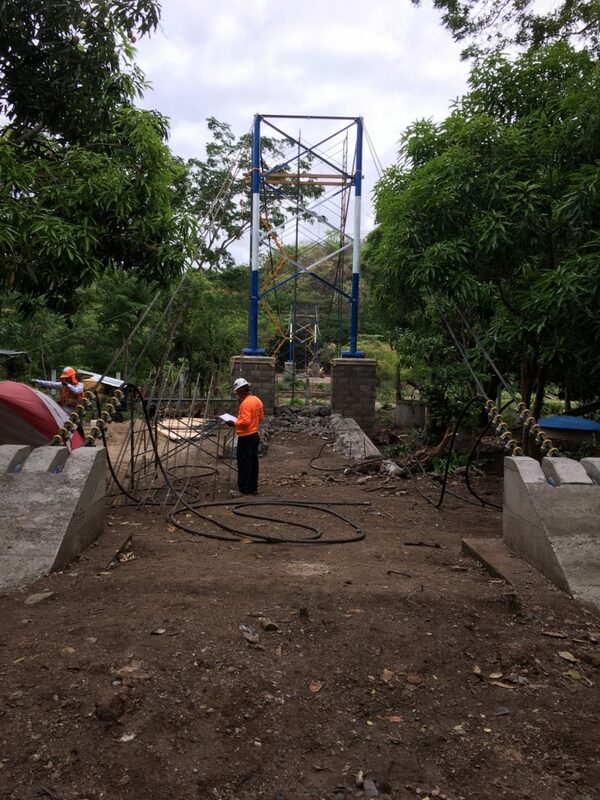 Due to the site being shut down and local team members being distracted by protests in nearby cities prior to our arrival, our bridge’s ramps were not complete prior to our arrival. Julio wasn’t going to let that hold us back. We used an alternative method to lift the tower feet into the pedestal hinges. Watch the video below if you’re interested in our methodology for bypassing ramp construction. 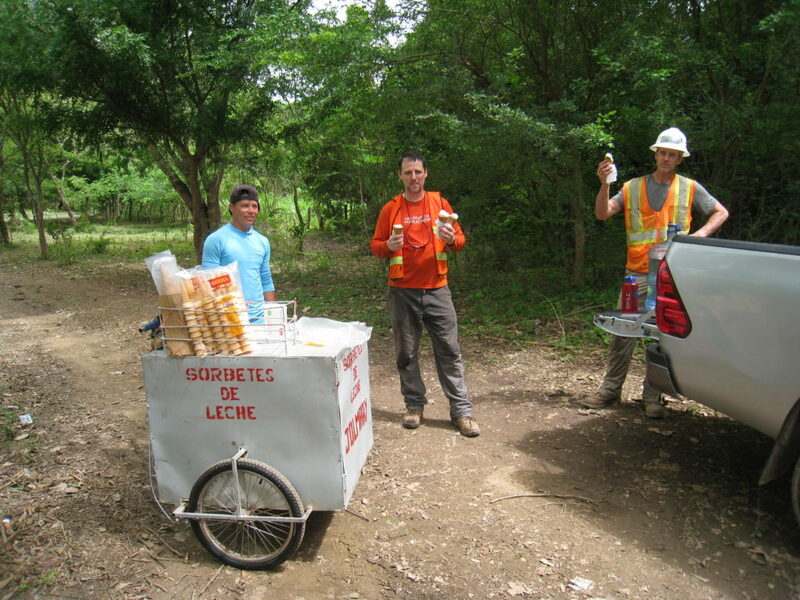 We eat all of our lunches and dinners up in the community of El Riito which is a short trip up a hill from the river. We were driving up there at first, but we’re starting to run low on gas which is apparently in low supply due to the protests. People walk now, or find other ways up the hill. 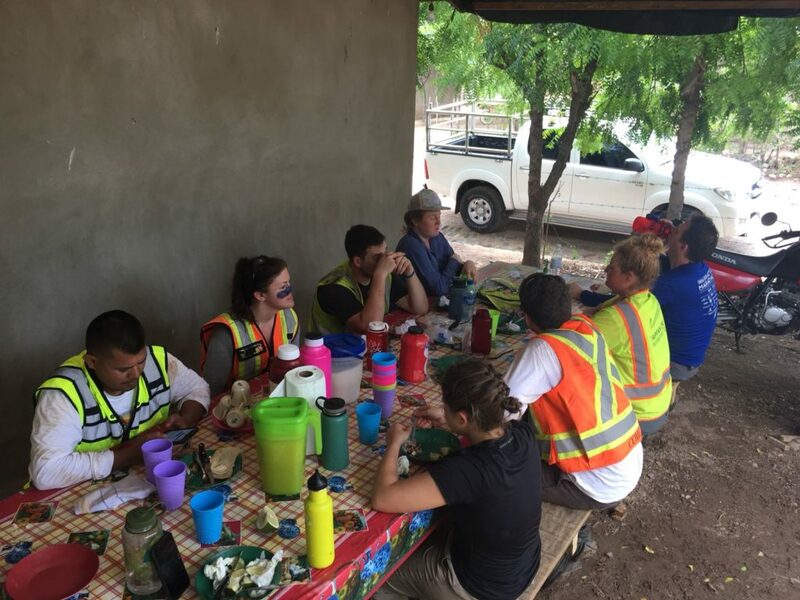 Eating meals with the whole crew, including foreman and engineers from B2P is one of the best parts of the day. We all look forward to that first cerveza after a long days work with dinner, it’s keeps some of us motivated to get work done on time. In some other news, Aaron Pettis finally showed up on site. He missed his flight due to a delayed connecting flight, and was seriously delayed due to the protests and roadblocks. 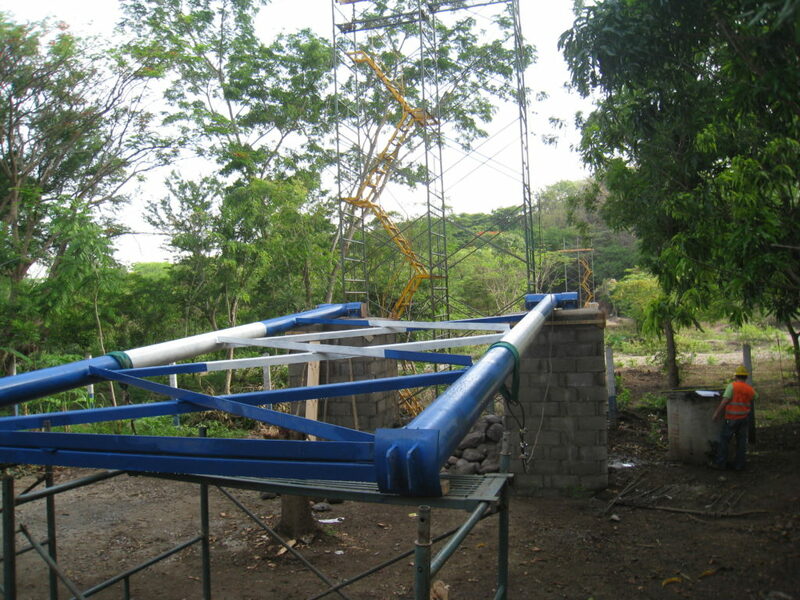 Bridges to Prosperity kept him safe in Managua until they were certain it was safe to send him our way in Palacaguina. We’re all glad to finally have our full team on site. Day three is coming to an end, and it was an eventful one for sure. Most of us woke up around 530 and went through our personal morning rituals before convening for breakfast at our patio just outside our rooms in Palacaguina. We’re staying in a few hotel rooms at a coffee processing plant about 5 minutes from our job site. The coffee industry in Nica is big money, so the dorm style rooms we’re staying in are actually much nicer than expected. Oh, and i forgot to mention, the view from the hotel is absolutely incredible. 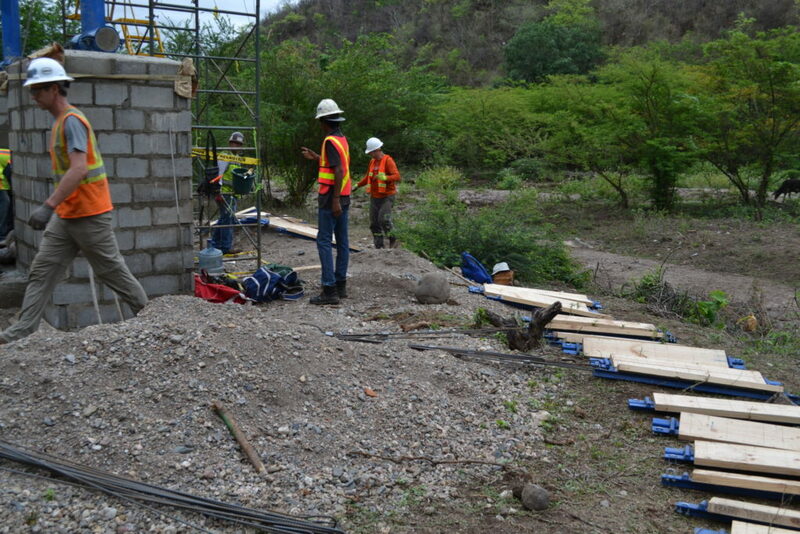 At 7am we drove to site, and began our work. First things first, we met most of the locals, about a dozen showed up today to support our efforts. 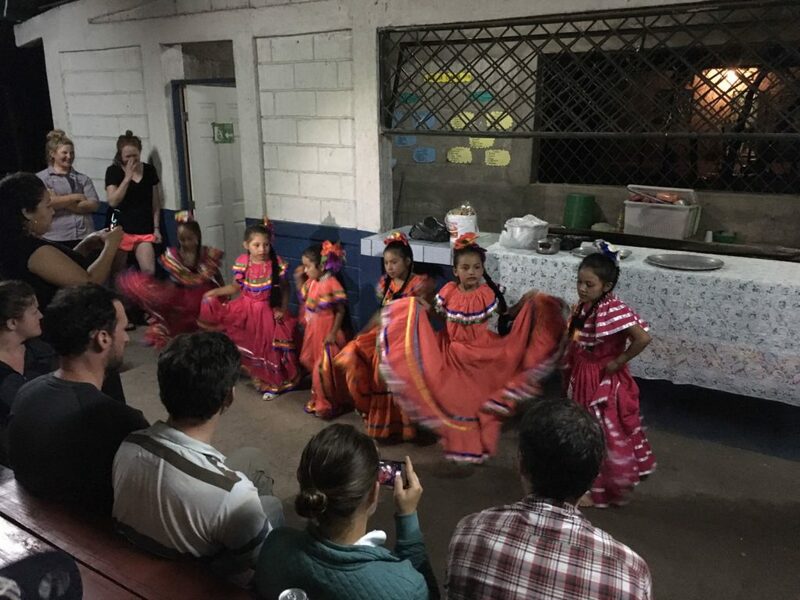 From what I could understand with my limited Spanish skills, they were extremely grateful for our volunteerism and contribution to their community. As John Brestin conveyed in perfect Spanish back to the community, we are just as grateful for the opportunity to work on such a fulfilling and enriching project. Francisco Pavia the program manager for B2P in Nicaragua ran a morning toolbox talk and stretch and flex in order to get us oriented and ready to go. 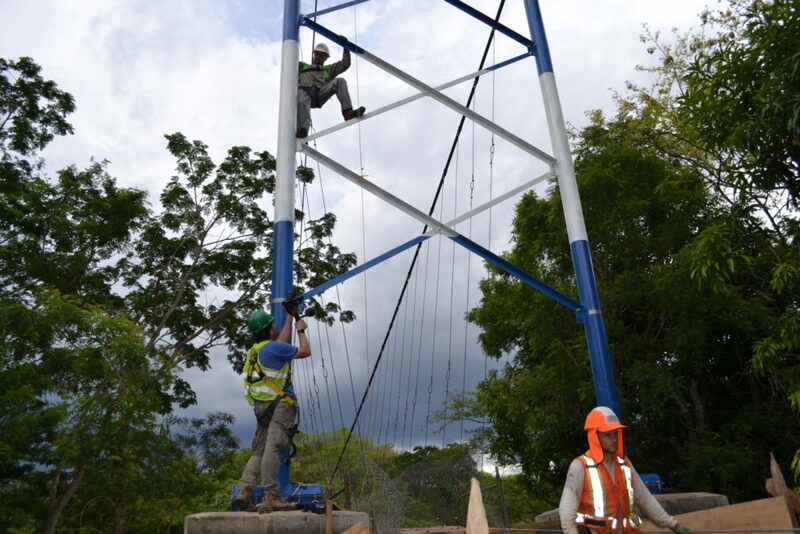 Fist task of the day was to build both of the scaffold towers behind each of the tower pedestals. A task which sounds easier said than done. 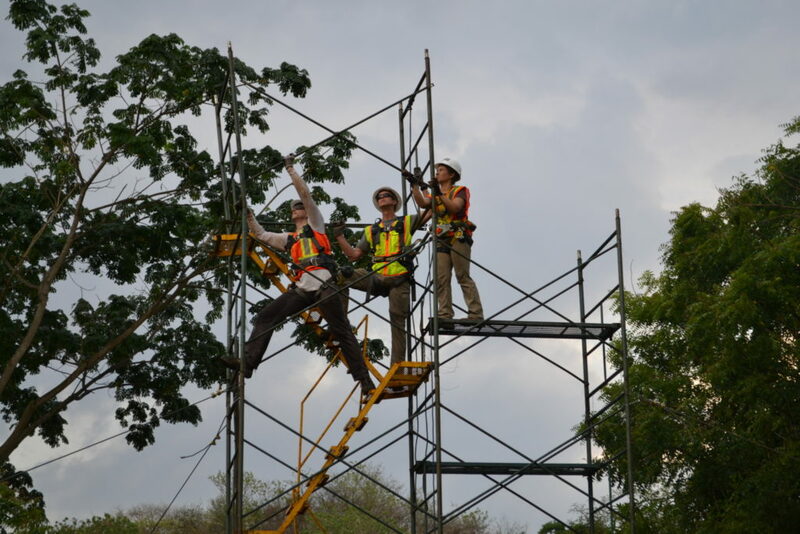 We inventoried our scaffold, loaded up and mobilized to site. 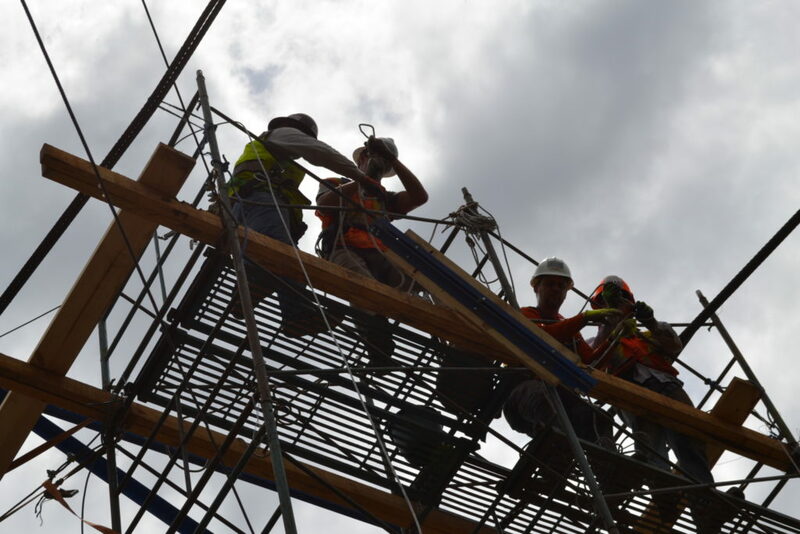 Our scaffold was 7 sections high or about 35 feet. We split up into two teams on either side of the river, and of course, some friendly competition broke out. One team had the edge to the top by about an hour, the banter between teams hasn’t stopped since. 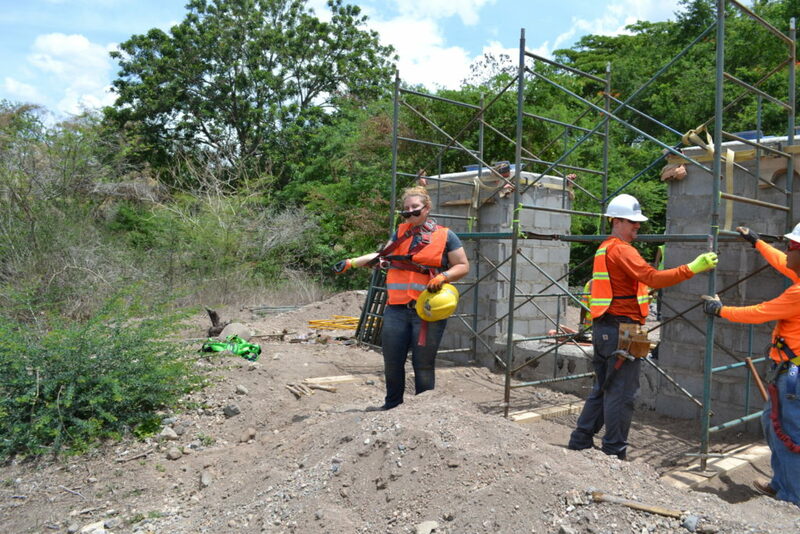 Building the scaffolding was hard work in the scorching Nicaraguan sun, however very gratifying to finish. James Paterson, Skylar Lee, and Shelley Collins erecting their tower on the (slower) other side of the river. Towards the end of the day, a familiar face, Juilo Chicas showed up on site. 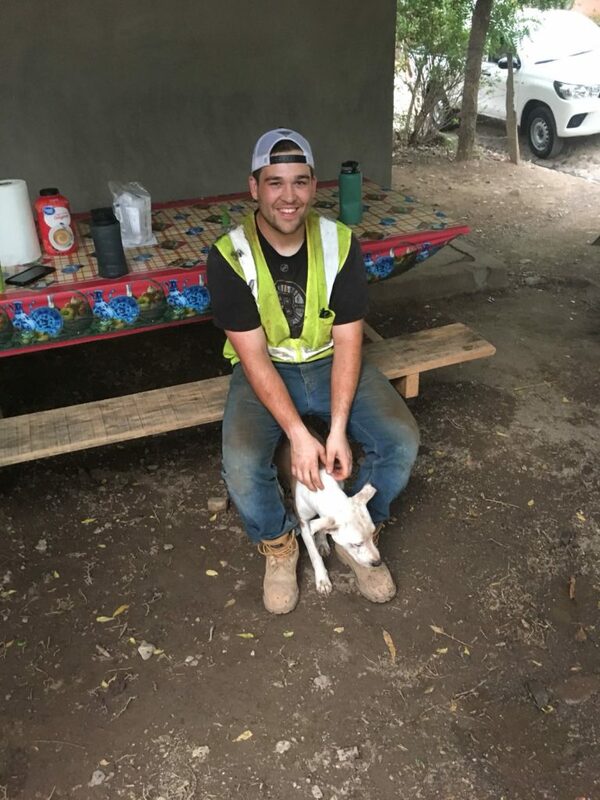 After he had been trapped in Managua for a day due to the roads being blocked by protests, he decided enough was enough. Julio is familiar with Latin America, being from El Salvador he utilized his familiarity with the culture and road system to venture through the back roads to our site in Palacaguina via rental car. At the end of the day we met up in the community of el riito for dinner. A generous local named Sonya donated her land, time, and effort for us to eat dinner comfortably. We all spoke about our long day erecting scaffolding and the banter continued. Here’s to another productive day tomorrow. Also shout out to Shelly Lee, word is she’s an avid reader of this blog. Well, we made it! 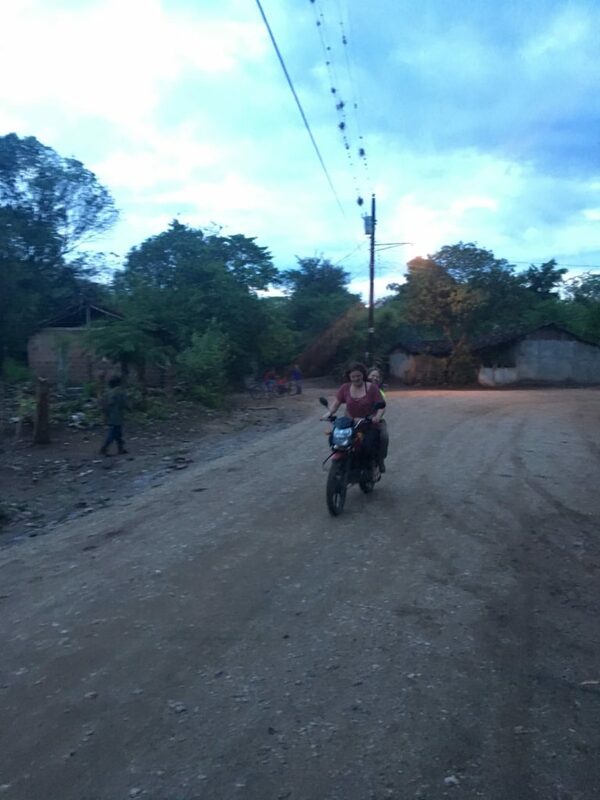 A journey which was supposed to take 3 and a half hours from Managua to Palacaguina ended up taking about 10. We ate breakfast and departed Managua around 8 am. 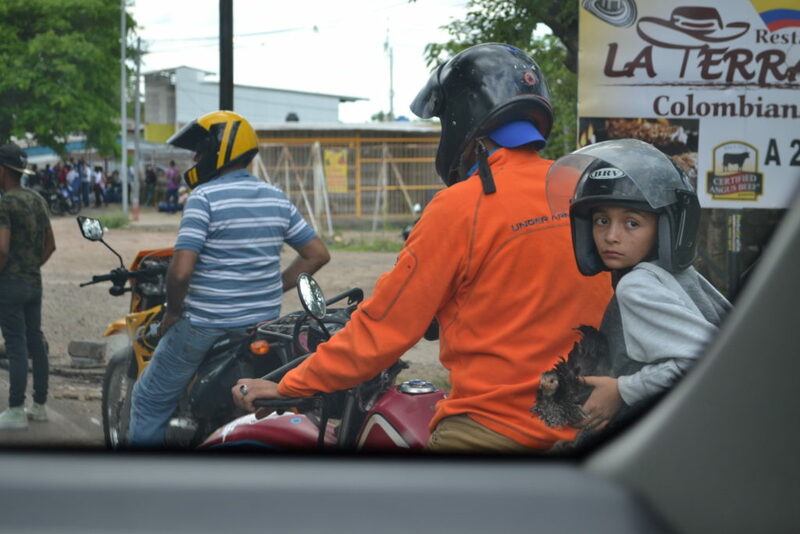 Around 1030 – 11 am outside the city of Esteli we ran into a huge traffic jam which ended up being a protest of the current president Daniel Ortega in the form of a roadblock. 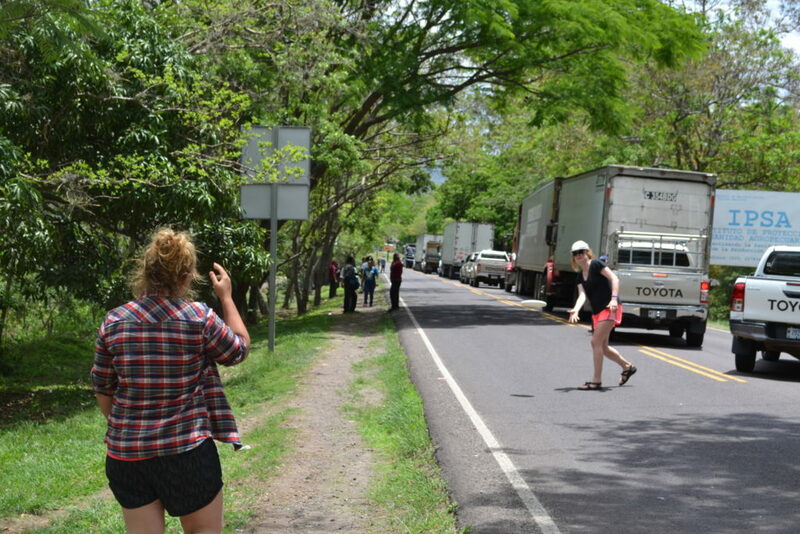 Protestors blocked the Pan-American highway, which is the only through way for about 4 hours. From what I understand the university students around Nicaragua have been protesting ever since Ortega tried to lower social security benefits and raise taxes at the same time. Also some would say his concentration of power, for example his wife being the vice-president, is bordering nepotism. The social security reform seems like the proverbial straw that broke the camel’s back in this situation. The younger generation of Nicaraguense are still out protesting despite the fact that Oretga has backed off his change to the social security system, it seems like they want to see some concrete change before they will be appeased. We spoke with a few people, and while the roadblock was an inconvenience, the protesters saw it as a way to bring attention to their concerns and demands. Although anything of this nature is hair raising, the protests were peaceful and eventually they let traffic through. 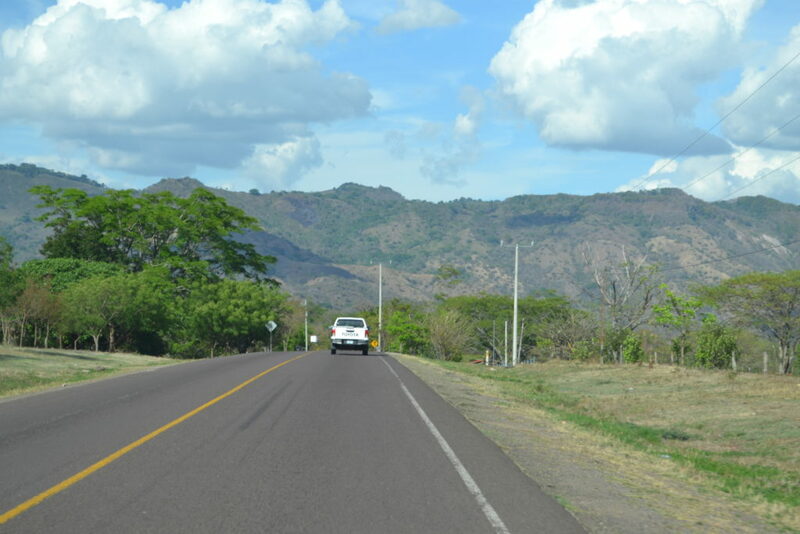 Apparently there is a different route back to Managua which is about an hour longer than the Pan-American highway, however it doesn’t go through any cities or area with universities. I would venture to say we’re going to take that route back on our return trip. 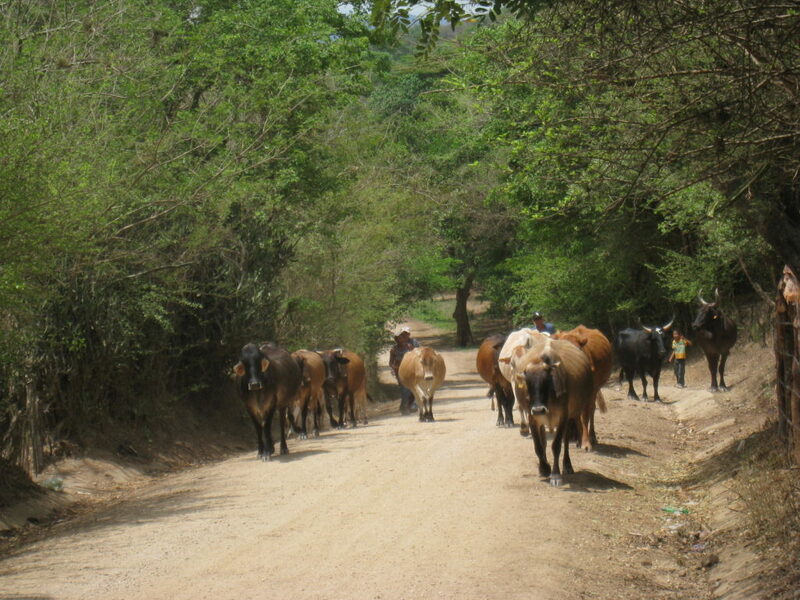 Either way, we’re here, safely, and now that we’re up in a rural part of Nicaragua, roadblocks shouldn’t be an issue. Today we also met our bridges to prosperity program leader Francisco Pavia, and his foreman Esteban. They both seem like awesome people and we all can’t wait to work alongside them for the next two weeks. 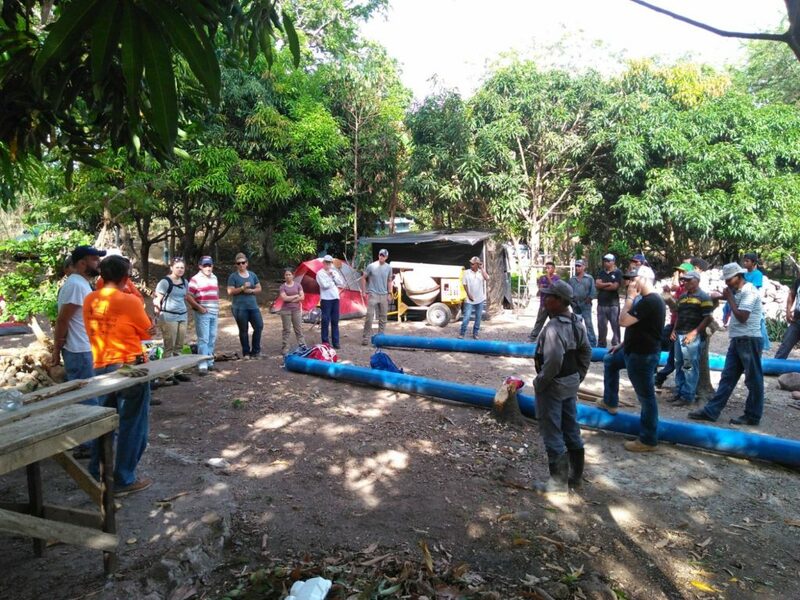 Tomorrow is going to be our first day on site, we will meet the community members, brief the team on safety and the overall construction plan, and then begin to inventory our materials. We can’t wait to get started. Stay posted for updates! A welcomed sight, Open Road! with a nice view! 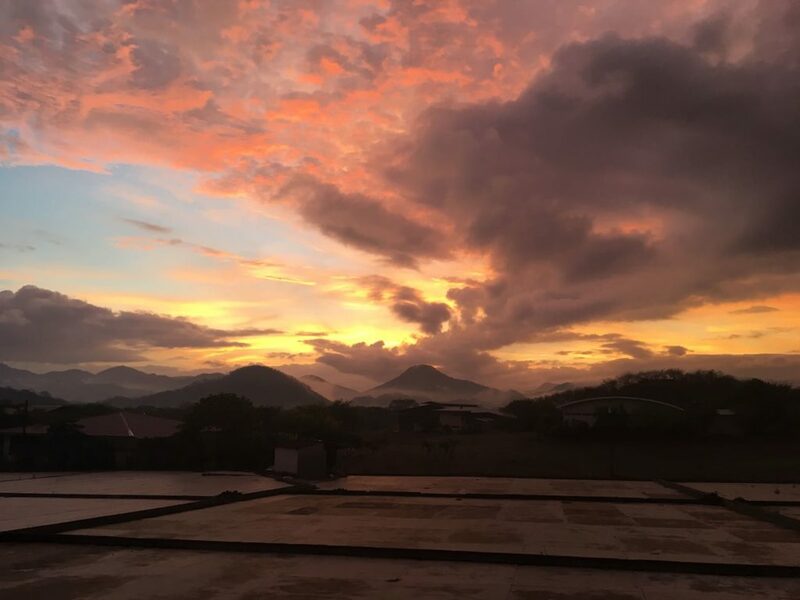 Day one of the trip is coming to an end, and most of the team has made it’s way to the capital city of Managua. We’re still waiting on a few late flights to come in tonight and tomorrow morning before everyone has arrived and is ready to venture to Palacaguina. Those of us who were fortunate enough to get here early today had some extra time on our hands. Naturally we decided to venture into the city and go on a small exploring expedition. After what we learned to be a seriously overpriced taxi ride (whoops! ), we were in the city center and taking in the culture that Managua has to offer. For the center of a capital city on a Saturday afternoon it was eerily quiet. We later learned this was due to recent government protests which forced the closure of businesses and commerce. Despite the fact that most businesses were closed, the B2P team members who were there managed to have a fun time exploring. 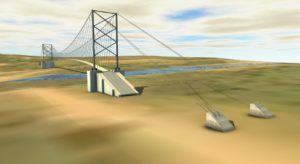 Here are a couple of 3D renderings of the completed suspension bridge that were made by COWI. 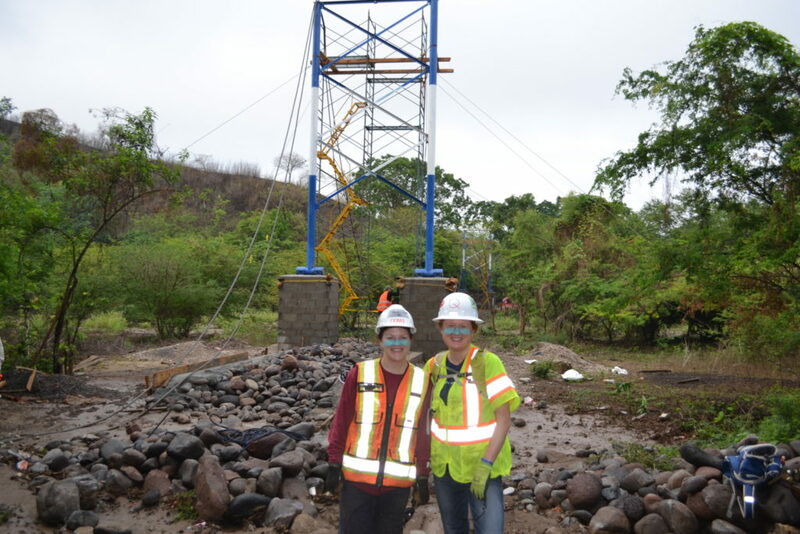 This page was created to relay information back home from Nicaragua, in order to keep the friends, family, and co-workers of Traylor and COWI volunteers up date on the progress of the El Riito Bridges to Prosperity build. 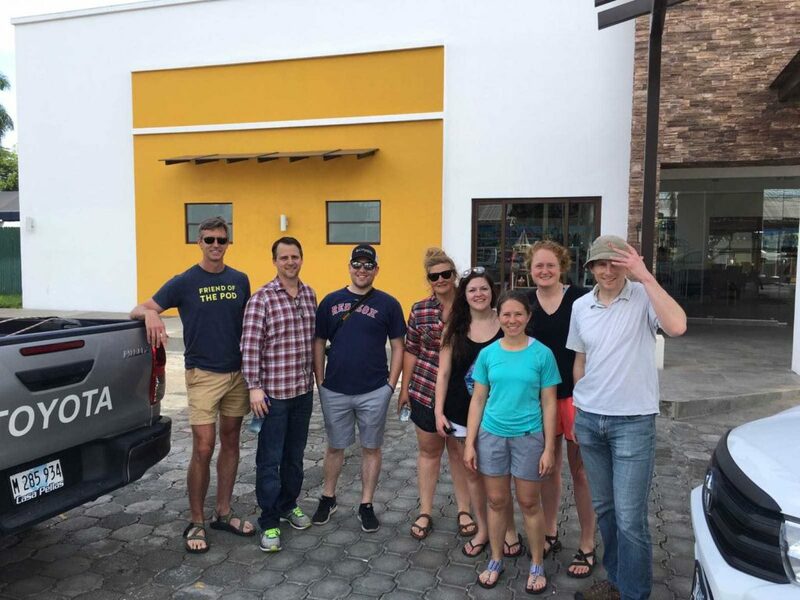 In just four short days our team, comprised of ten people, half from COWI and half from Traylor, will embark on our journey to Palacaguina, Nicaragua. 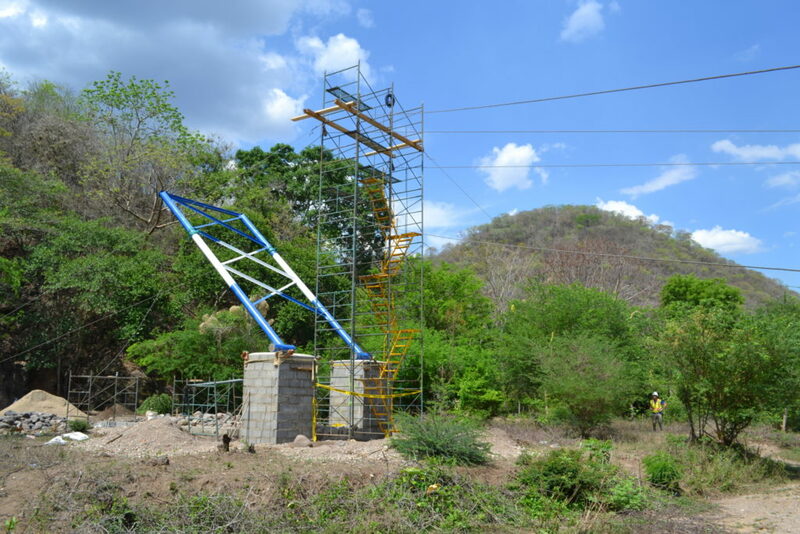 Our goal in Nicaragua is to safely and efficiently construct a 74 meter suspension bridge across a river in a rural community. 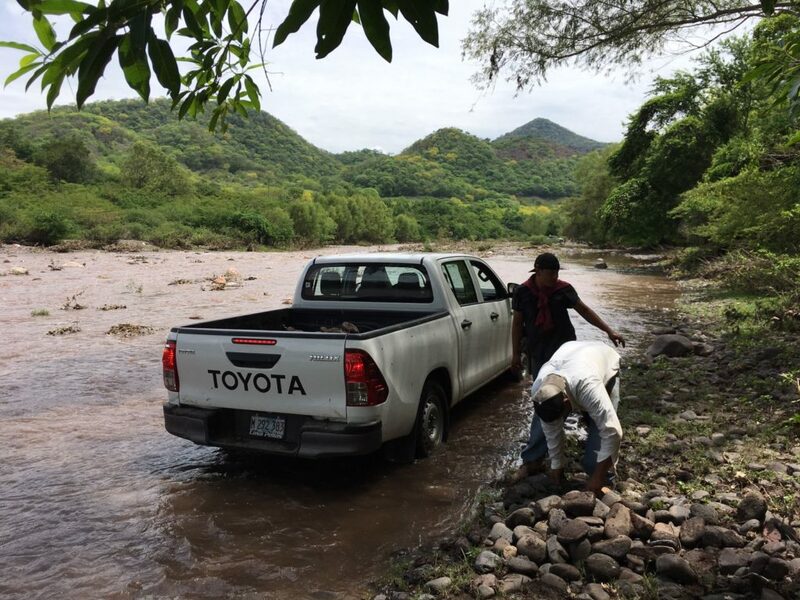 Currently the local community members of Riito Arriba must cross a river, which becomes turbulent and deep during the rainy season, in order to access critical resources. 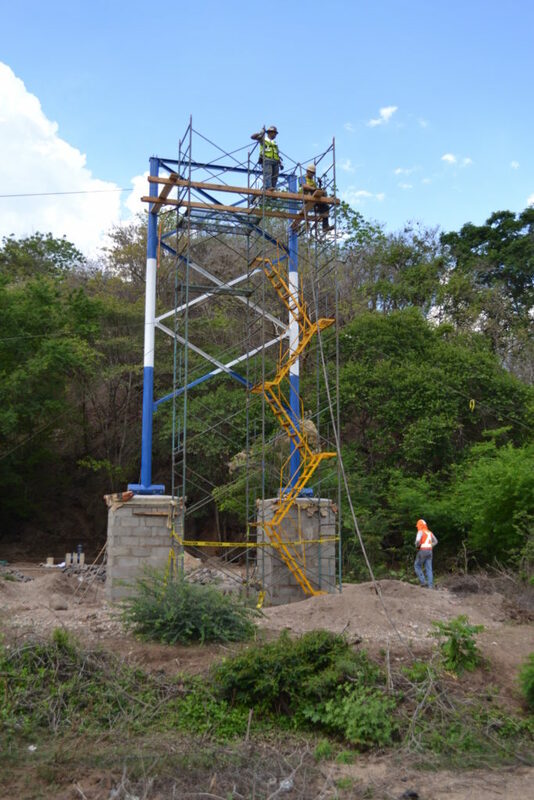 Once constructed, this bridge will provide safer access to healthcare, education, economic opportunities, and other crucial aspects of life. 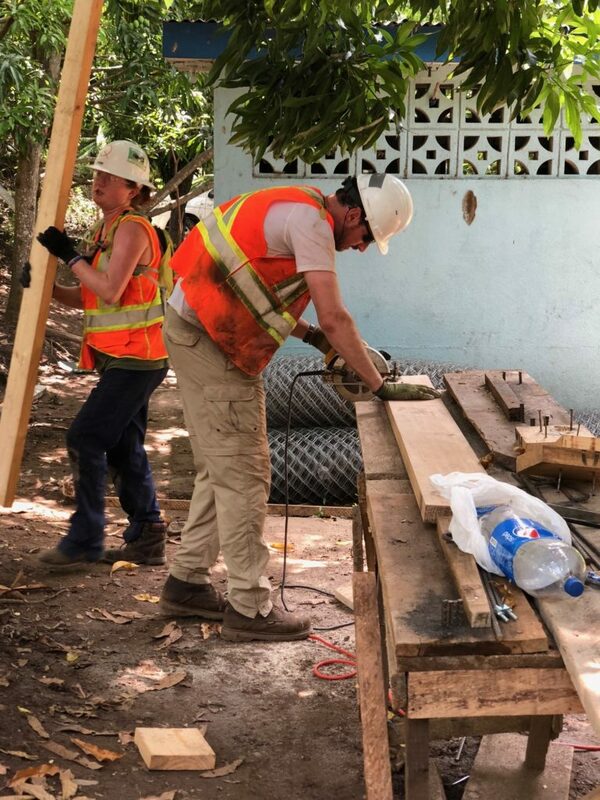 The Traylor/COWI team has been hard at work since February planning for the logistics of the trip, the construction of the bridge, safety, and communications while on the trip, in order to ensure a smoothly running project. 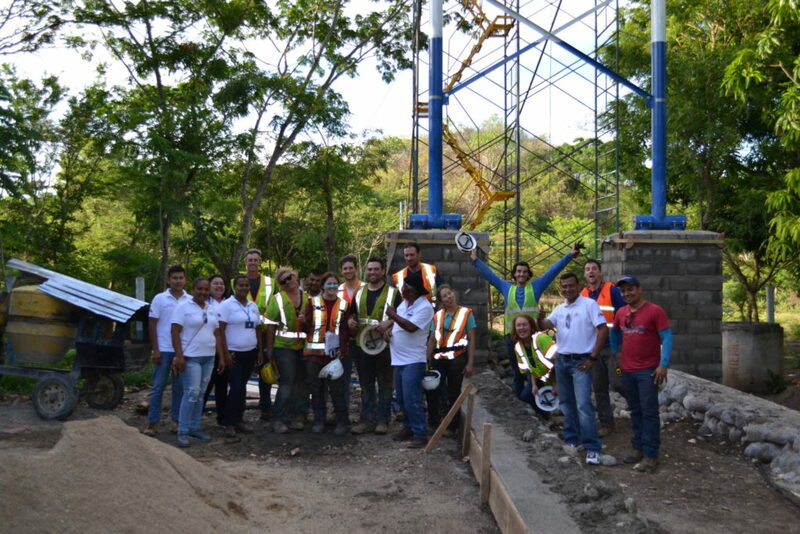 Members of the Bridges to Prosperity in-country team, along with help from the local community have been busy for the past few months as well. 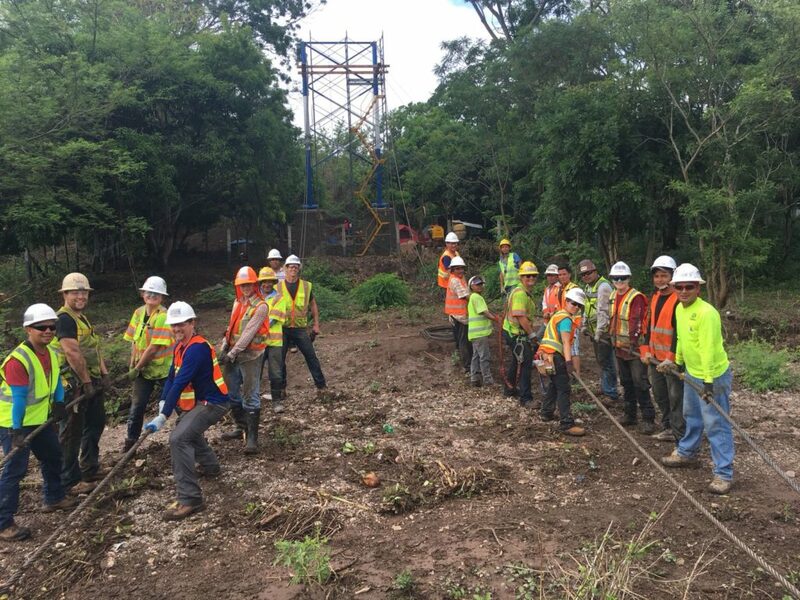 They have been working to ensure the cable anchors, tower footings, and tower pedestals will be constructed when our team shows up. 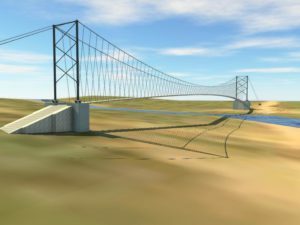 They have also ensured long lead procurement items, such as the towers and suspension cables, will be on site ready to go for our team. 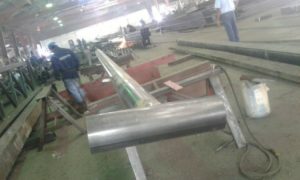 Pictures of the work done so far can be seen attached to this post. I know everyone on the Traylor/COWI team as well as the B2P team is eager to get to work and get going on this amazing project! 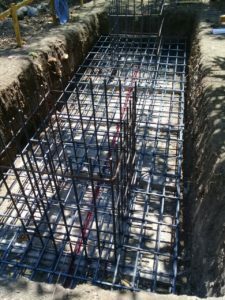 Anchor Beam – Freshly Poured!